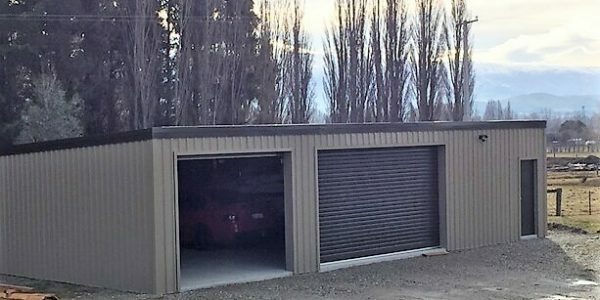 Looking for a local builder to construct your new carport, farm shed, commercial premise or industrial building, or community building project? We strongly recommend choosing a local professional you can trust with your new build. It could be the best building decision you’ll ever make! When it comes to building local, you can’t beat the benefits of local expertise, and the likelihood is you’ll be enjoying a better service overall. Plus, you’ll be keeping it in the community! All of this translates into a much better building experience for you. Here are some of our top reasons for choosing a local builder for your next shed or building project. The number one benefit when you’re dealing with a local builder. Better communication and service. Trying to get in touch with a large building corporation can leave you frustrated. Work more closely with a local and you’ll get everything you were looking for. Our team are all local business owners. 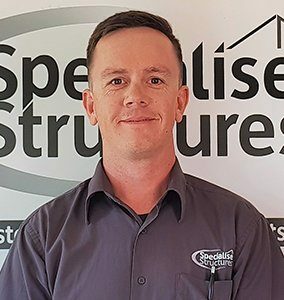 They are all building professionals who take pride in offering great service, and the best building experience through the Specialised Structures Building System. 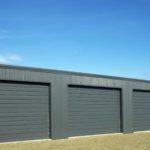 You can work more closely with your builder to create and customise sheds and buildings to suit your exact requirements. A good builder will work closely with you to bring your vision to reality. From ideas to design, products to plans, and construction to completion. Having the time to discuss what the building is for, what your current needs are and what the future holds is key to – ensuring your solution will be fit for your purpose, for years to come. Learn more about the discover, design and build process here. Another important consideration is the experience a local building professional has of your local area. With this expertise, a local expert will bring in-depth understanding of building for your area’s weather conditions, the local economy, and the community. They’re ready to take into account, terrain, snow loads, wind and earthquake demands – built to withstand your local conditions. Most importantly, they’ll be on top of council consents, building code compliance and safety requirements, so your project meets building standards, and stays on track! Find out what’s required when building and renovating in New Zealand. Behind every good builder is a strong network of staff, subcontractors and suppliers. Local builders depend on good relationships with customers and community members, so they’ll make a point to work with the best! Choose to go local and you’ll benefit from working with someone who has established a reputation, both personal and professional, on their excellent work for customers. We’re proud of our team of passionate and professional local business owners ready to offer their professional advice and support. 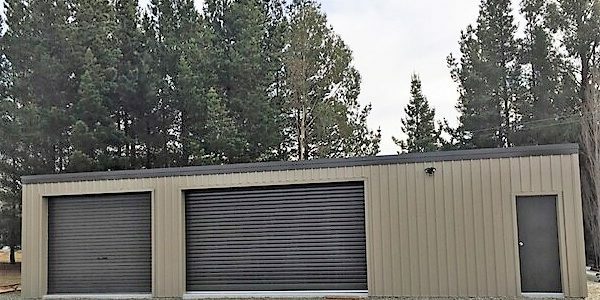 There’s also the advantage of knowing that your builder has access to building materials and solutions fit for your local conditions.They’re ready to take on board specific aspects of your local terrain, snow loads, wind and earthquake demands. The Specialised Structures building system specialises in customised portal framed buildings. This includes structural steel, cold rolled steel, timber framing to concrete tilt panel. No need to be concerned about low-ball costing, inferior work or escalated prices once the job begins. Professional builders know what it takes to do something right and how much it costs, and they’ll tell you upfront. Give us your building details and we can give you a free no-obligation estimate. Better yet, you can do it all on the Specialised Structures website! Request an estimate online today. Building is quite a process so you’ll want to make sure you are working with someone who can make sure the process is hassle free. Here, local expertise, strong relationships and commitment to service can all make a big difference. Your local builder will make it easy to keep things ticking along on time and on budget. If there is a problem, chances are they will be in touch to keep you informed of what is happening. Read our Frequently Asked Questions page for more information on our building process. If your building needs change, or you’d like to be more hands-on with the building process a local builder is probably a better option. Larger companies simply can’t be so flexible. In fact, many have tied-in agreements which are not so easy to adapt for the needs of your project. 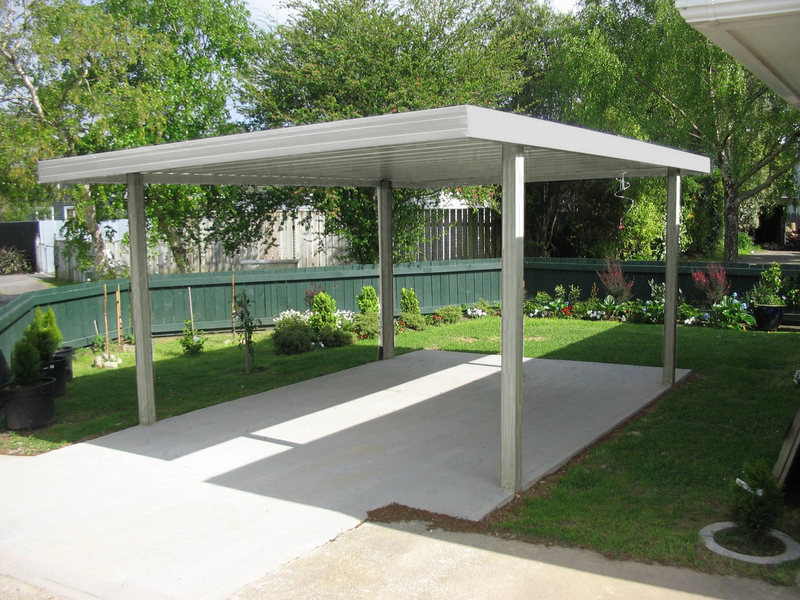 At Specialised Structures, we can provide customised solutions for any purpose. Not only can you customise your building, but you can also decide which part of the process you want to control! 9. Support from start to finish. A professional builder will help you to put it all together – from ideas to design, from products to plans, from construction to completion. 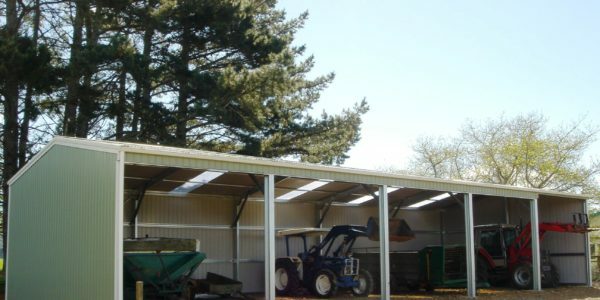 You can have the confidence that your local Specialised Structures merchant will work with you every step of the way. If trust alone is not enough; you’ll have the confidence of working with a local builder that has committed to a contract. 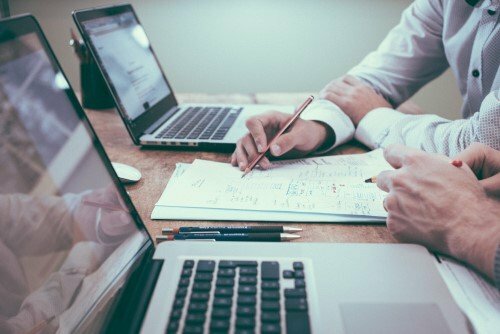 Professionals who back it up with a written contract that spells your project out in detail – what, how, who, when and how much. When you choose Specialised Structures, you get to combine the benefits of a local builder, with much more! Check out some examples of what you can build with us and request an estimate online today. Whatever your needs, we’re here to help. Our network is made of seasoned building professionals all well-connected and trusted as within their local communities. Each individual business owner combines their local expertise and knowledge with the solid backing of the Specialised Structures network. Build something with one of our passionate local experts. For friendly and reliable advice or to chat about your building project, get in touch today or call 0508 787 828 to talk to your local Specialised Structures expert. 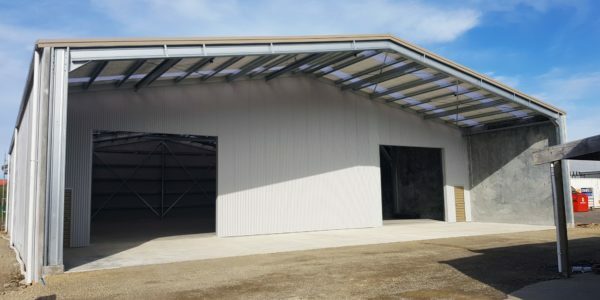 Choose from the best range of custom farm sheds and kitset buildings… made to stand up to your farming needs now, and for years to come. 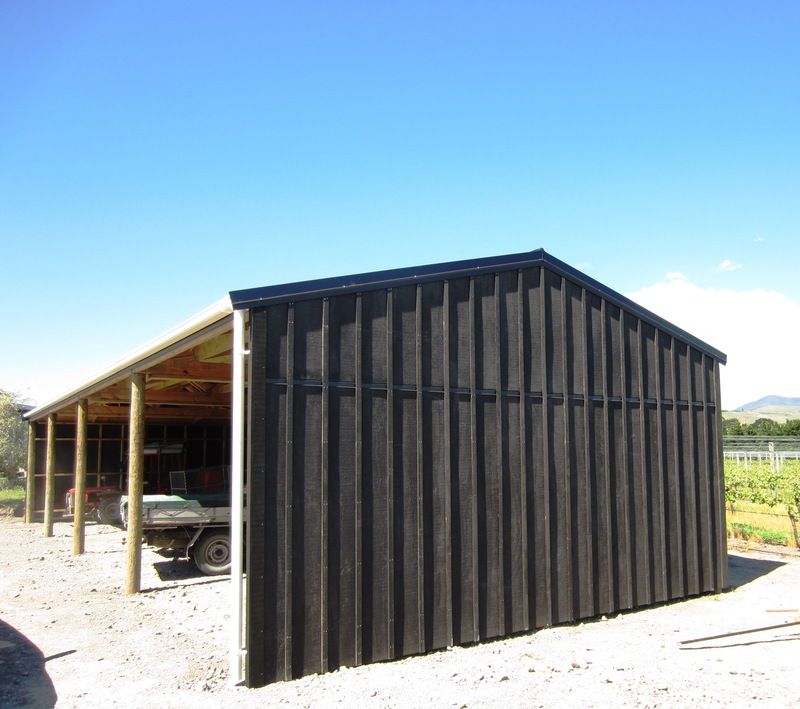 Specialised Structures are proud to be among New Zealand’s industry leaders in custom farm shed and rural building designs. 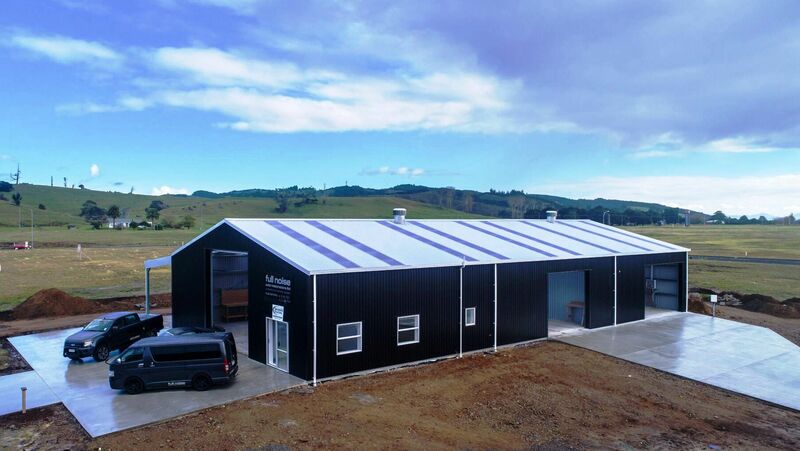 Our buildings offer exceptional flexibility and are designed to meet the most asked for features and requirements of New Zealand farmers today. As pioneers of cold-rolled steel construction solutions for rugged rural environments, you can be confident that our structures stand up to the demands of modern farming. 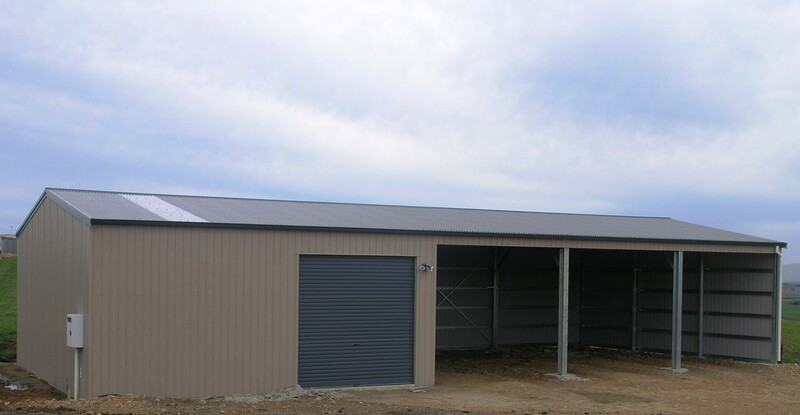 Our rural buildings and kitset farm sheds are fully customisable and flexible to suit budgets of all sizes. 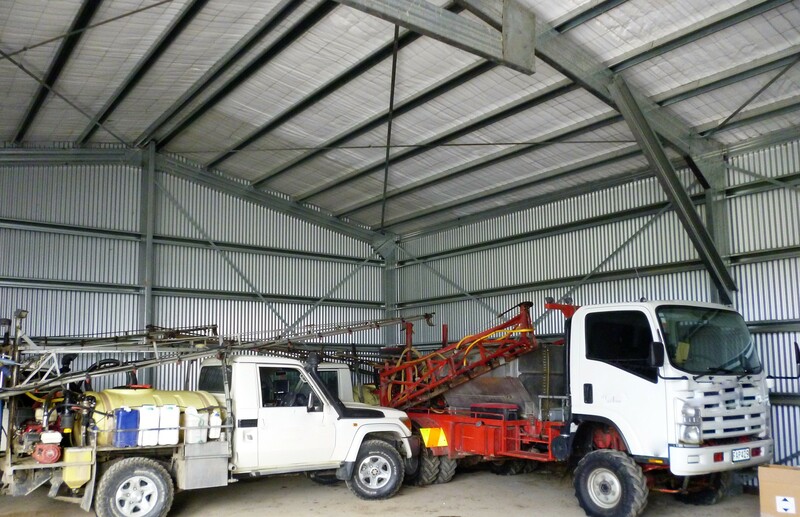 This makes them suitable for a wide range of farming requirements. Our network of qualified building experts have both the experience and local knowledge to design, discover and build the best structure for your faming requirements. As a result, you will benefit from a personalised and professional experience, providing exceptional service and value for money. 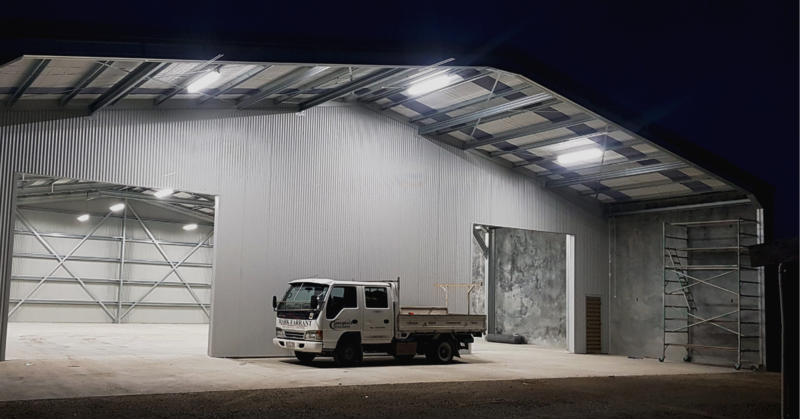 Specialised Structures farm sheds are designed, engineered and produced in New Zealand – offering the ultimate range in quality materials, features, and flexibility to meet every farming need. 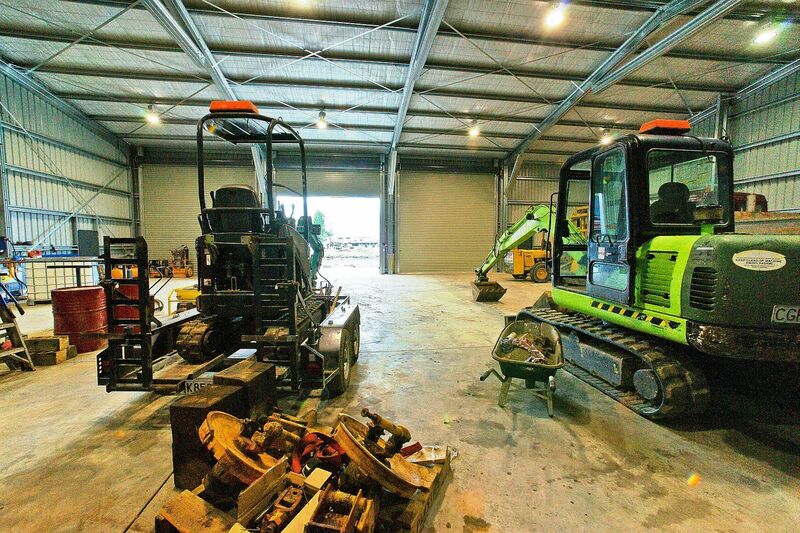 Ever wondered what your new shed would look like with living quarters, or a new workshop attached? All of this is possible thanks to the exceptional flexibility offered by modern building techniques. Specialised Structures buildings can be tailored to suit every intended use – now, and for the future. 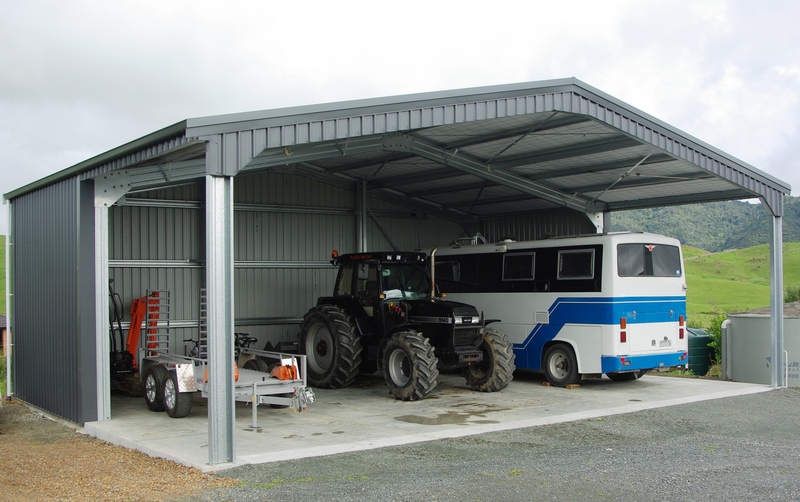 Whether you are looking for better stock protection or need more room to store equipment, or have the need to keep vehicles, tools and implements sheltered, our custom or kitset shed designs have you covered. 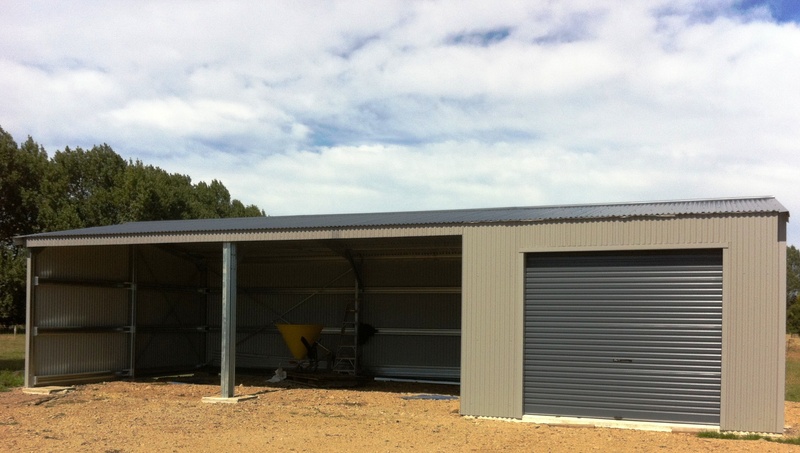 From woolshed to cow shed, wintering barn or implement shed, our buildings can be customised to suit. 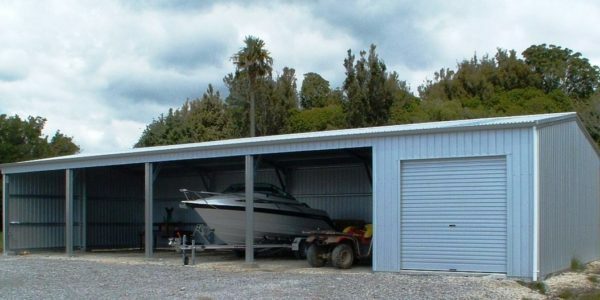 Perhaps you’re thinking about an aircraft hangar, a new storage shed, garage or carport for the ute… and the boat! 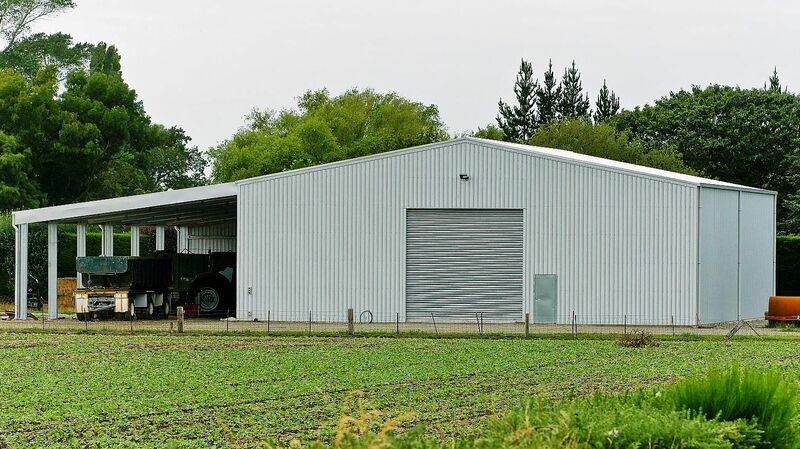 From the smallest operation to the largest agricultural enterprise, we understand the needs of your business and have rural building options to make your dream a reality. 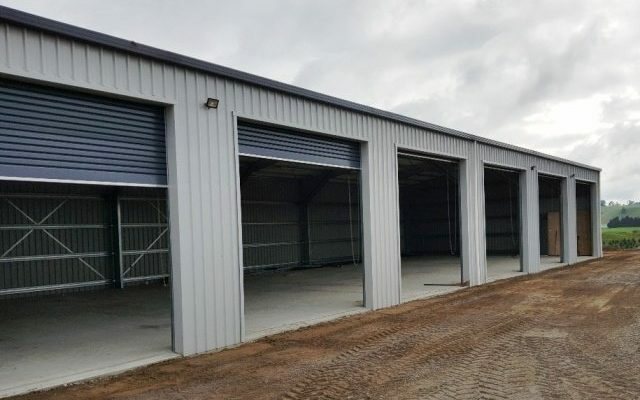 Specialised Structures offer a large range of building types and sizes, and they can customise any building to any size and style. 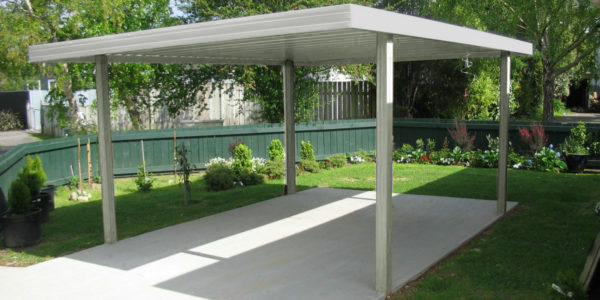 Choose from a wide range of materials, including timber and steel. Build a shed as small or as large as you like! 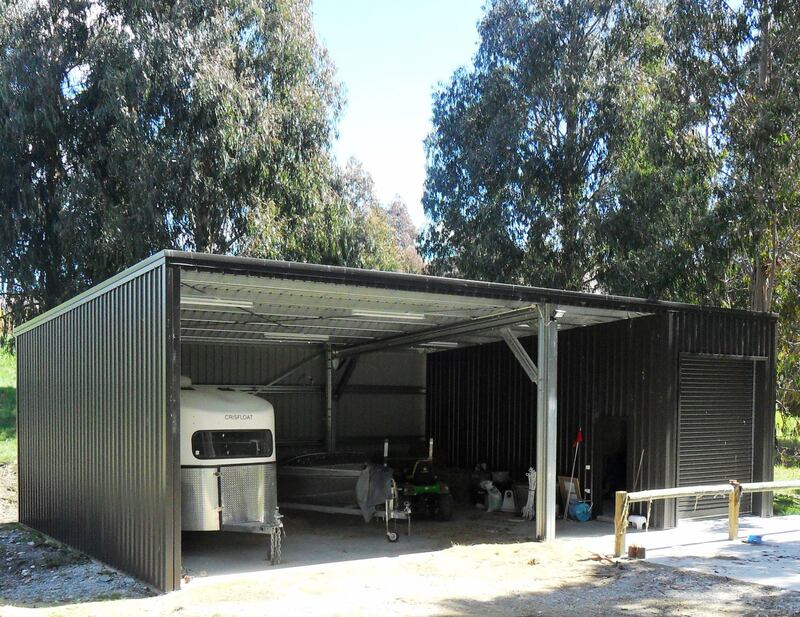 A shed with a 30-metre clear span is no problem with our cold-rolled steel product. 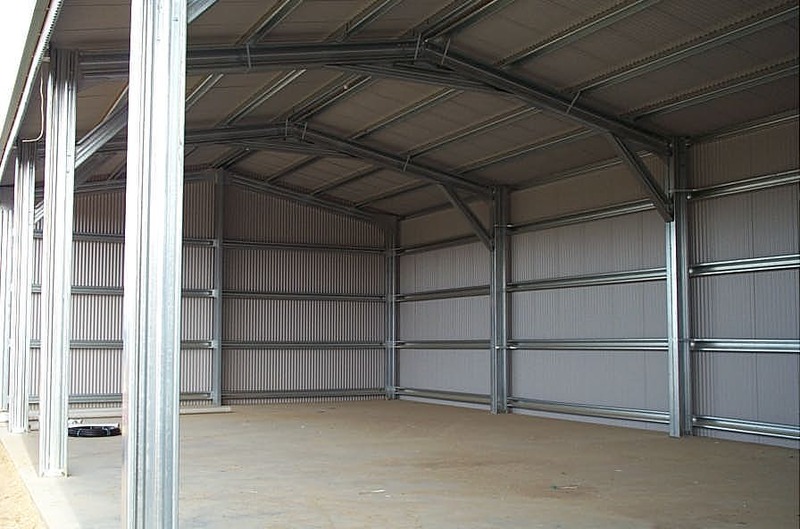 All types, sizes & claddings, mono-pitch and gable roof can be accommodated for. Choose your own measurements and bay size to suit your exact requirements! If you’d like to contact us to discuss what you’re looking to build with your local building expert, they’ll be happy to give you an idea of costs, options and what you can build for your budget. 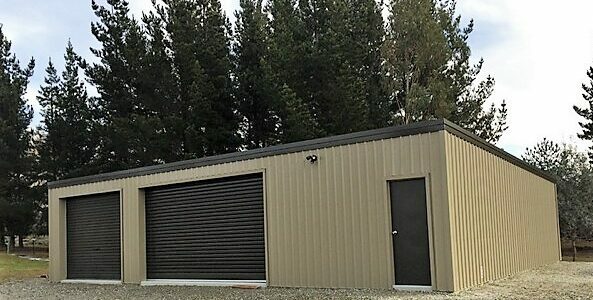 Designed with New Zealand conditions in mind, these buildings are strong and robust to suit the unique needs of your environment. 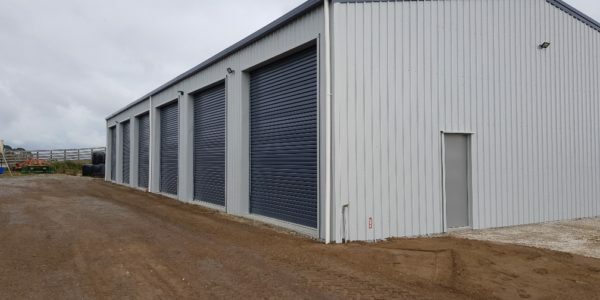 Each of our buildings is engineered specifically to the site requirements, taking into account terrain, snow loads, wind and earthquake demands – built to withstand your local conditions. What’s more, all Specialised Structures branches are independently owned and operated. You’ll be met with a personalised approach to the requirements of your building project, matched with a wealth of local knowledge. 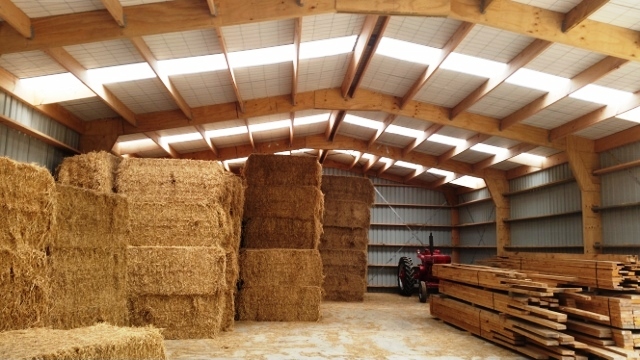 Ready to get started on your rural building project? Call O508 787 828 for a free consultation today. Built with materials to withstand weather extremes and the day-to-day wear. They’re sourced from New Zealand too, so you can be sure that they’re made to last. Not only will they look great, they are a great investment guaranteed to add value to your property. 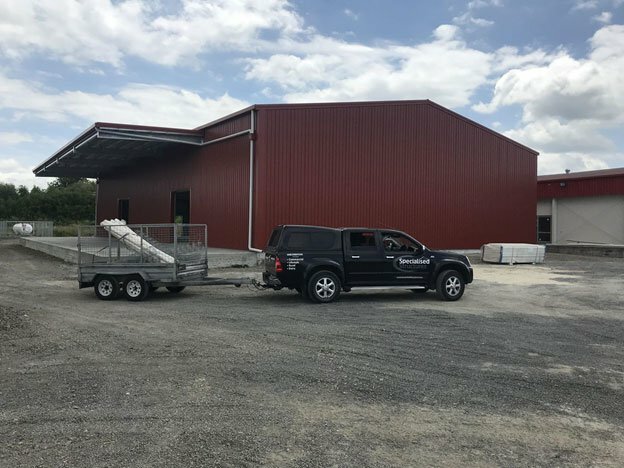 To top it off, we make building custom farm sheds process easy, by helping you to design and meet your specific business needs and environment. 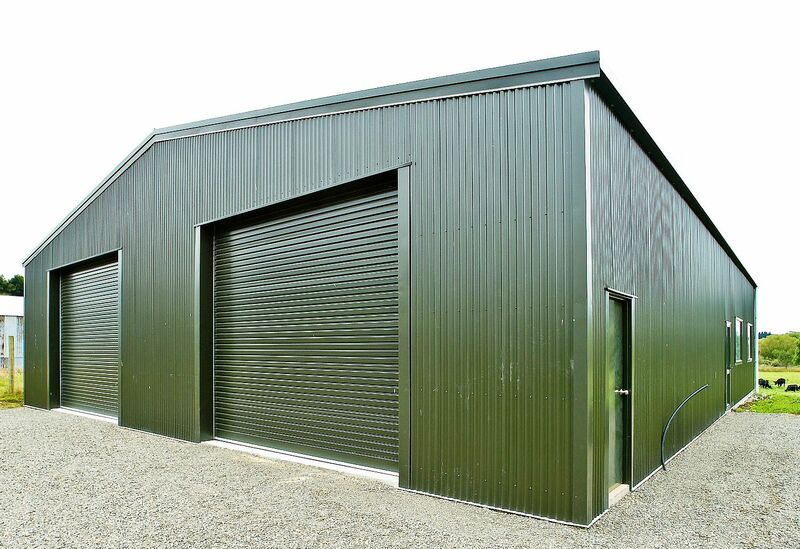 Our aim is to give you the most economical building to fit your requirements. 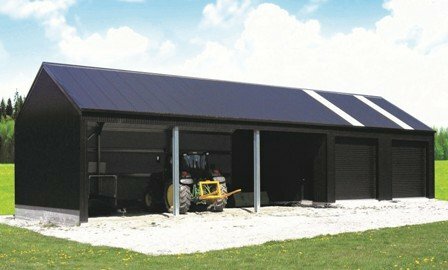 Could you Build A Kitset Farm Shed Instead? 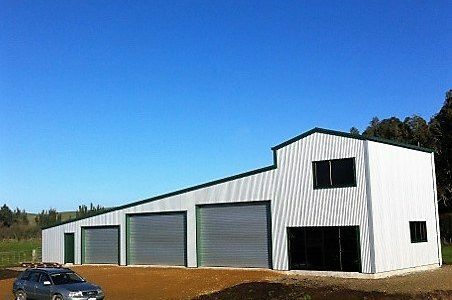 If you’d like to save on costs, Specialised Structures also supply construction kits should you wish to manage your own building project. 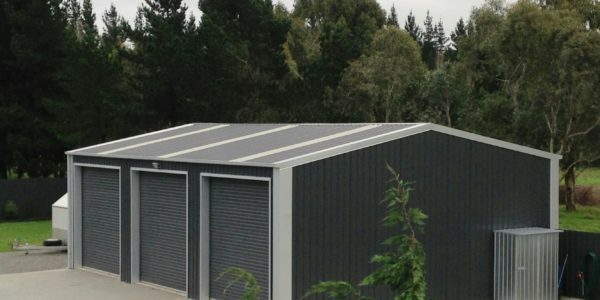 Kitset Sheds are an affordable solution to budget constraints. We can supply you, or your builder, a construction pack with everything you need. You have full control over your kitset building project. Or Specialised Structures can take care of the whole building process for you, from concept to completion. Our building experts can look after every stage of the process. From design and engineering to council consents and the actual construction of your building. 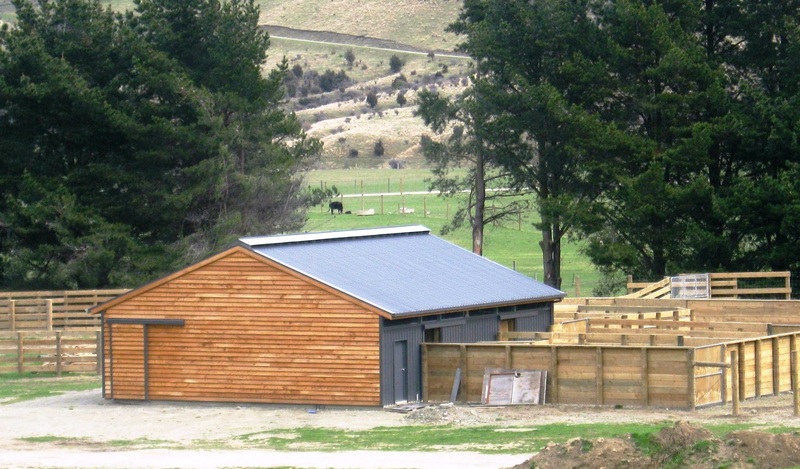 Interested in building a custom farm shed or kitset building? 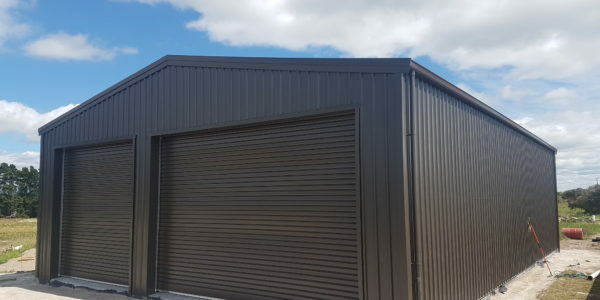 Request an estimate online today or call now on O508 787 828 for a free consultation with your nearest Specialised Structures Building Expert. 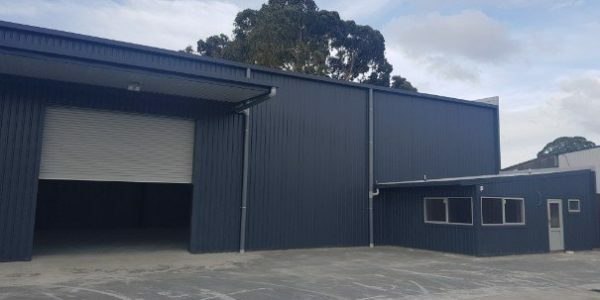 No matter what the size of your business, choosing the right industrial or commercial building for your business and operations can be vital for ongoing profitability and success. That’s where Specialised Structures can make all the difference. 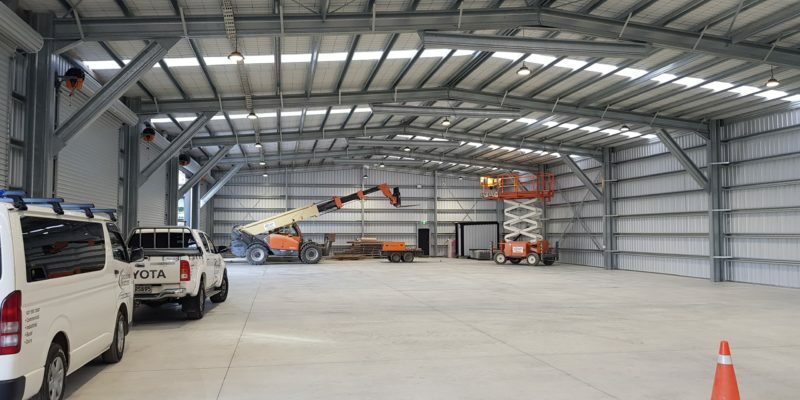 View a small selection of industrial and commercial building projects in our gallery below. Got a specific building requirement? Just ask! Our local building experts are here to listen, design and build something which meets the unique needs of your project. Request an estimate online or give us a call today to tell us more about your project. Our local building experts understand that every client’s requirements are unique. That’s why we take a customised approach to every building project. 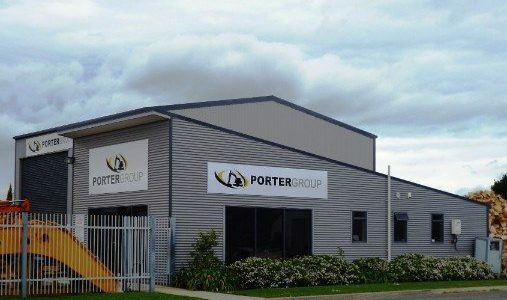 Whether a client is seeking a boutique distillery or craft brewery, pet food factory, an aircraft hangar or packaging warehouse, logistics facility or commercial showroom. 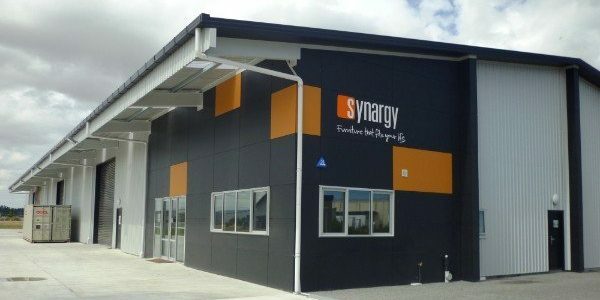 Specialised Structures has a proven track record of delivering solutions to meet a versatile range of projects over many industries, including Synargy Furniture Wholesalers, CRT (now Farmlands), NZ Dairy Packaging, Vent, Upright, Porter Group, Humes, Accessman, and Kiwi Spirit Distillery to name a few. 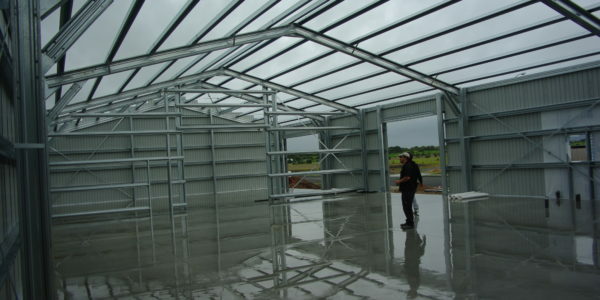 Specialised Structures buildings are engineered to be functional and robust. 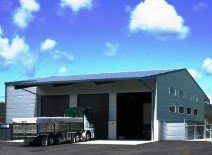 What’s more, they offer exceptional flexibility for a range of operational requirements, wide bays and clear span portal design. Our local building experts are equipped to customise, design and build to meet the specific needs of your project. They are ready to provide friendly advice and understand local conditions, and council consent processes. Every building challenge is met with a considered approach to technology, expertise and materials at hand to deliver the best possible result. Already have a project you’d like a price for? Request an estimate today. 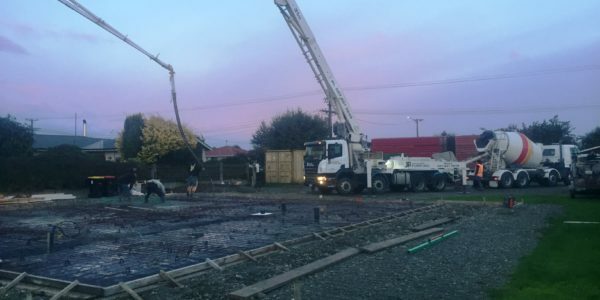 Can you picture yourself working with us as a Specialised Structures New Zealand business owner? 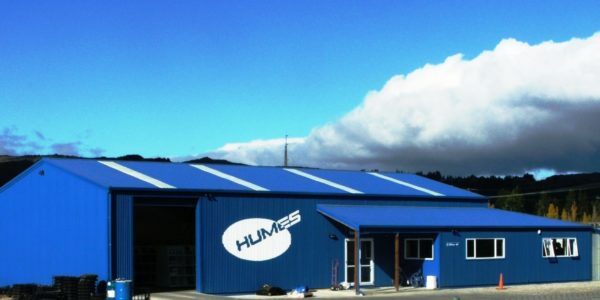 Due to overwhelming customer enquiry we now have opportunities to join the team in the North Island. Are you driven and enthusiastic? Do you have construction industry experience? Are you customer and team focused? Then you may have what it takes to join Specialised Structures! Meet some of our current business owners below and get in touch to learn more about joining the team today. 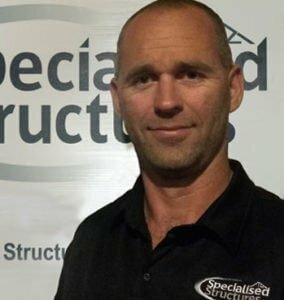 Specialised Structures New Zealand is made up of a network of trusted local building professionals serving local communities. Each builder individually owns and operates their construction companies, offering the Specialised Structures Building System. We’re proud of our team of successful business owners. 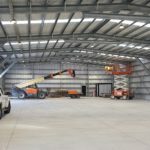 Not only are they highly experienced and qualified construction professionals, they’re known and trusted in their local communities as the building team who will get the job done. They share a good understanding of the challenges involved with building in their local environments. Many have years of experience spent working and living in their local areas. 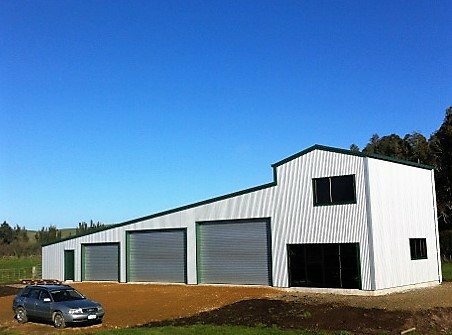 Providing customised steel building solutions to: Masterton, Carterton, Greytown, Martinborough, Featherston, Eketahuna and the wider area. John Hymers owns D R Borman Ltd and has over 30 years of experience in construction and project management. John is a keen squash player and member of the Red Star Squash Club and Wairarapa Squash Collective. He is also a member of the Chanel College Board of Trustees and Masterton Rotary. 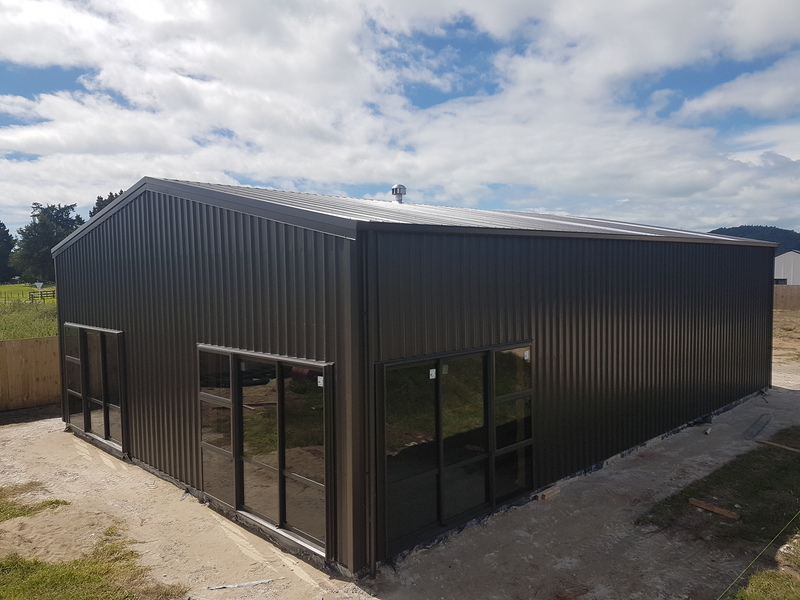 Providing customised steel building solutions to the following areas within the Bay of Plenty region; Tauranga, Mt Maunganui, Whakatane, Katikati, Te Puke and the wider area. 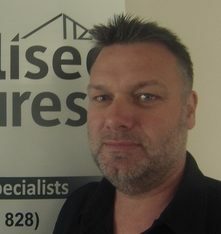 Andrew has worked in the construction industry since 1987. 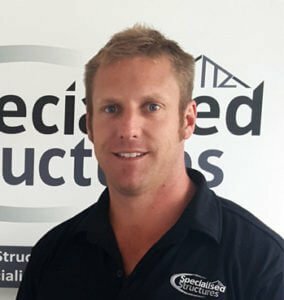 Originally from Dunedin, Andrew settled in Tauranga in 2004 and owns and operates his own business, Templer Construction Ltd. In his spare time you will find Andrew coaching one of his four boy’s cricket teams, or providing a free taxi service to and from these games. I was looking for a robust system that I could offer clients. Specialised Structures that covered so many options I felt the brand ticked all the boxes. 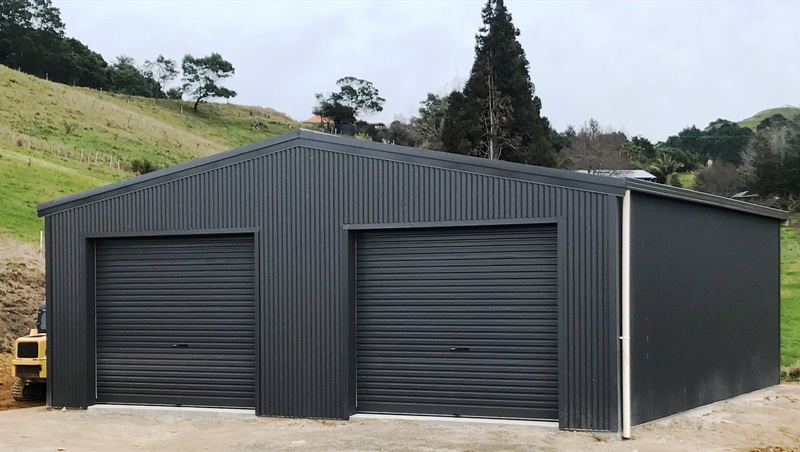 Providing customised steel building solutions to the following areas within the Central Plateau region; Rotorua, Reporoa, Taupo and the wider area. 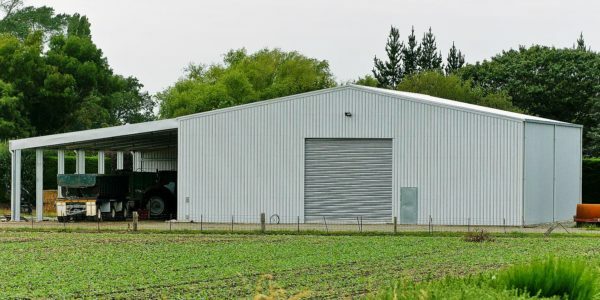 Gareth and Penny Copsey settled in New Zealand in 2004, where they started their Agricultural spraying business Copsey Contracting Ltd. Shed building became a great way of working through the winter months! 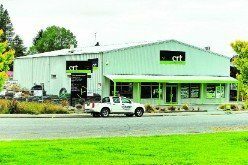 This side of the business grew, so in 2014, they established Copems Ltd in Broadlands Reporoa. 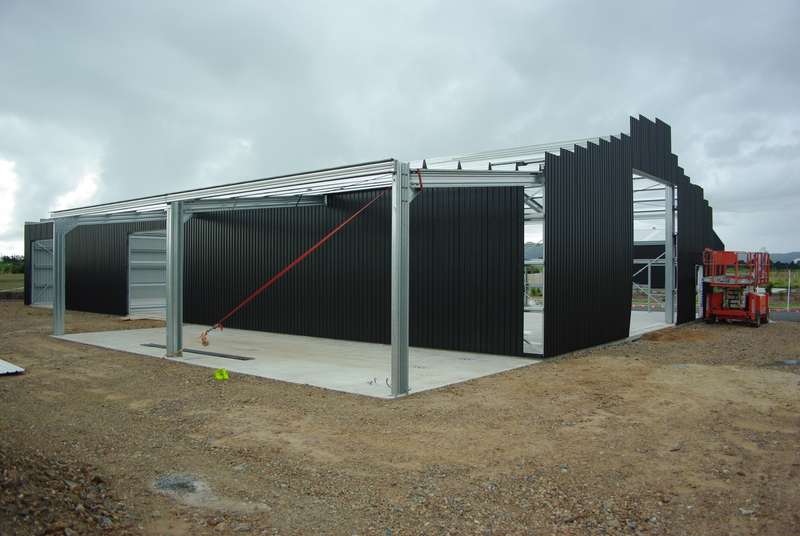 Providing customised steel building solutions to the following areas within the Tasman region; Nelson, Richmond, Motueka, Collingwood and the wider area. 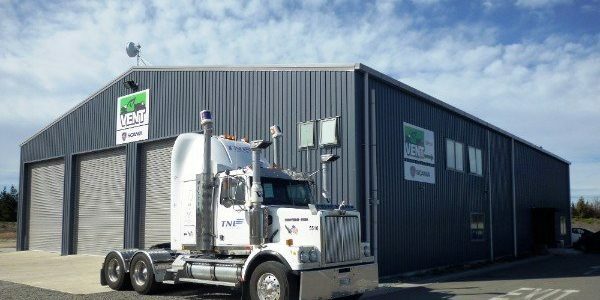 Lance Robinson is owner of the Cluster Construction Group and has lived and worked in the Tasman region since 1980. 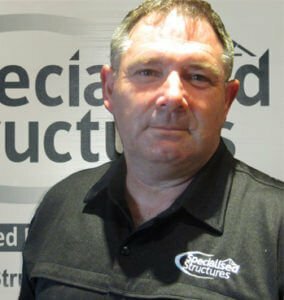 With 38 years in construction, his experience spans across commercial and industrial builds along with residential builds and alterations. 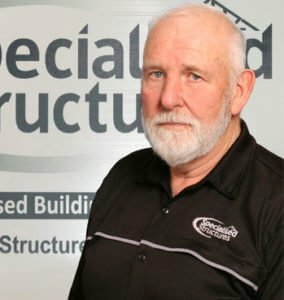 I joined Specialised Structures specifically to add customised commercial building solutions to my repertoire, but I also enjoy the diversity of Specialised Structures as well as the engineering and design included in a Specialised Structures building. 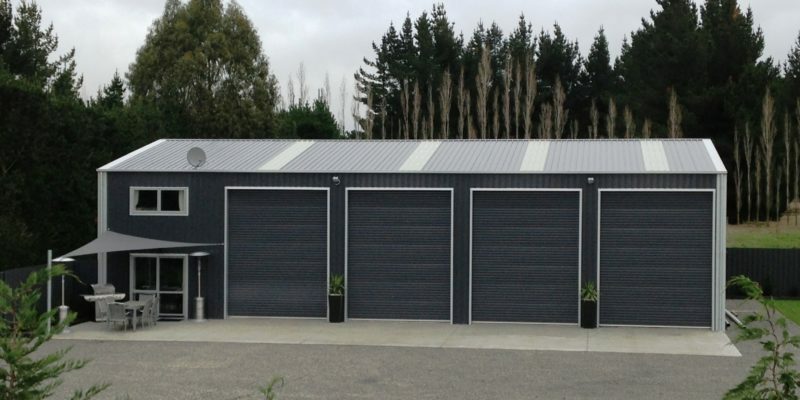 Providing customised steel building solutions to the following areas within the North Canterbury region; Christchurch, Rangiora, Rolleston, Akaroa, Kaikoura, Hanmer Springs and the wider area. Luke and Eric Anderson run Anderson Construction. Their team are well known for attention to detail, good quality workmanship, honesty and reliability. Anderson Construction are Licensed Building Practitioners and members of Site Safe. Buying into the Specialised Structures system was a move to widen our portfolio; to ensure we could build anything. 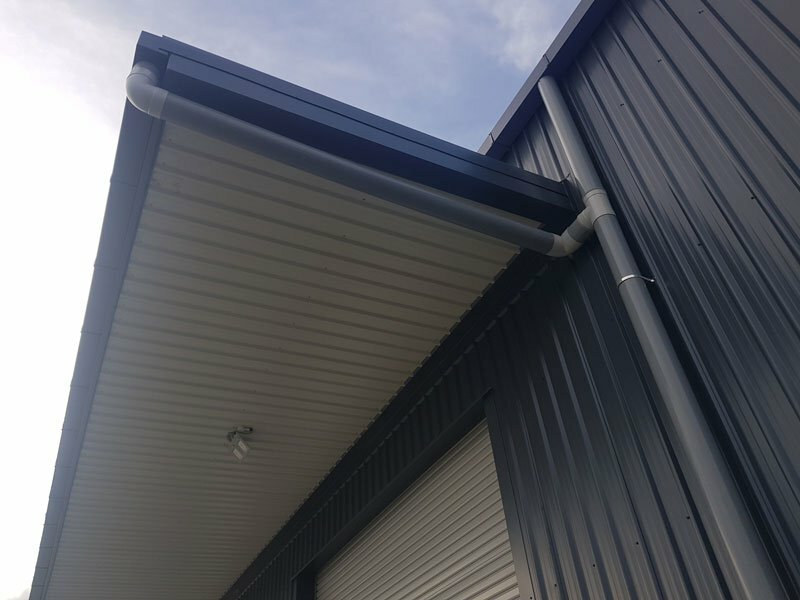 We like the high quality product offered by Specialised Structures – strength, quality and the ability to customise a building to fit a particular purpose. It’s a brand we’re happy to put our name to. 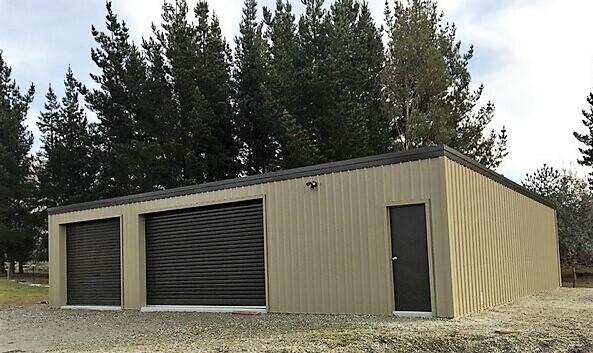 Providing customised steel building solutions to the following areas within the Mid Canterbury region; Ashburton, Methven, Rakaia and the surrounding areas. 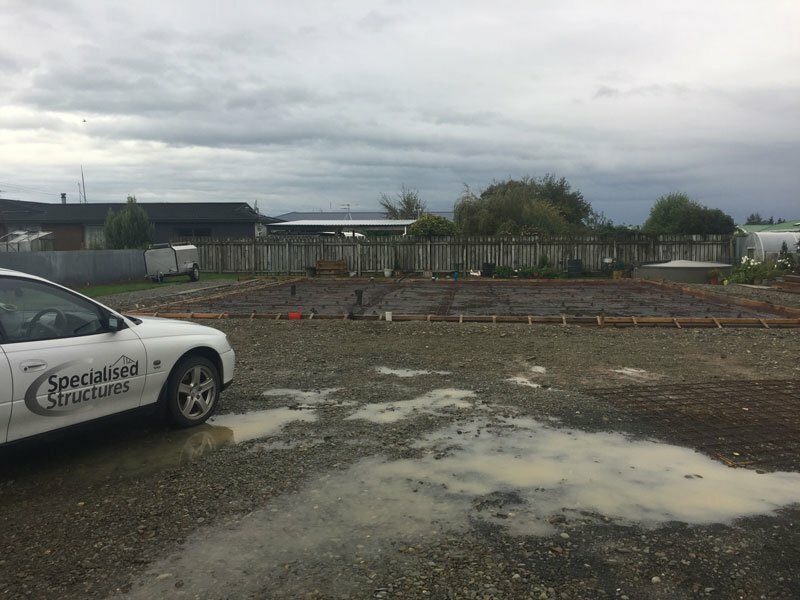 Ashburton born and bred, Master Builder Justin Quaid owns Quaid construction and is joined by a qualified team of builders and talented apprentices. A keen sportsman, he is currently a member of the Ashburton Squash Club. 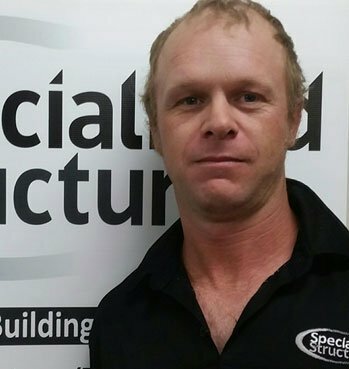 Justin is a Master Builder and Licensed Building Practitioner. I bought into the Specialised Structures system because I saw value in drawing on the expertise of a nationwide network. I also liked the versatility of Specialised Structures, enabling us to build anything. Plus, the buildings are strong and excellent quality. 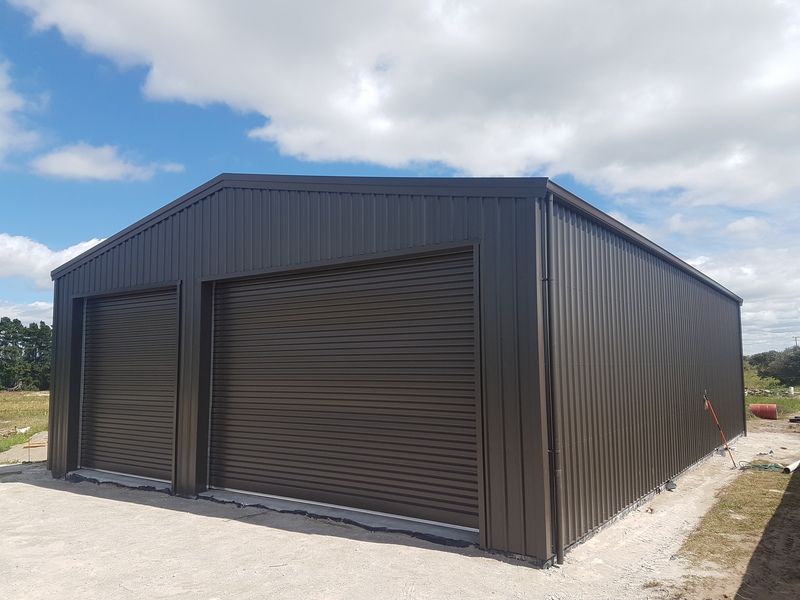 Providing customised steel building solutions to the following areas within the South Canterbury region; Timaru, Mackenzie District, Fairlie, Geraldine, Waimate, Pleasant Point, Tekapo, Twizel and the wider area. 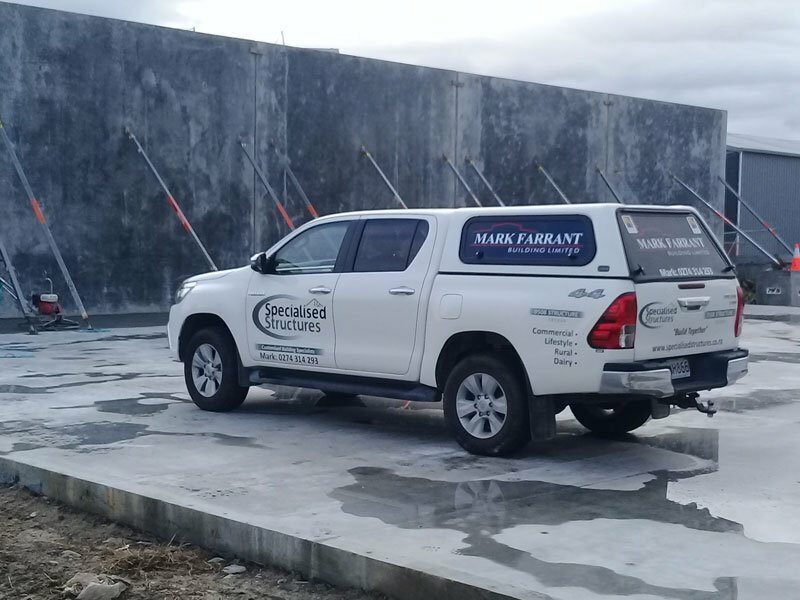 A Timaru resident for the last 30 plus years, Mark owns Mark Farrant Building Ltd, and has a good understanding of local building challenges. Friendly and practical by nature, Mark has a wealth of knowledge and a willingness to share that with his clients. The massive range of products and plans, plus history, experience and buying power are what I see as the key strengths of Specialised Structures. More importantly, I like the fact that we can cost-effectively design and build specifically to a client’s requirements. 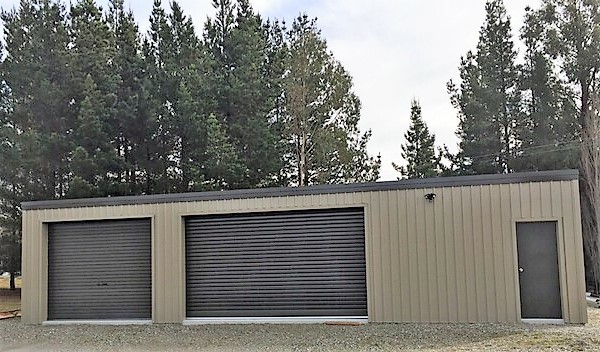 Providing customised steel building solutions to the following areas within the Central Otago region; Cromwell, Queenstown, Wanaka, Alexandra and the wider area. 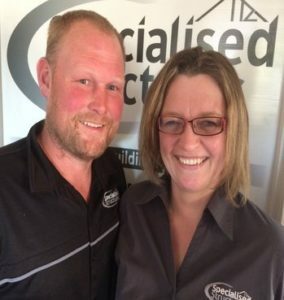 Greg and Judith own G & S Construction in Cromwell, operating across the Queenstown, Wanaka, Alexandra and the wider Central Otago area. 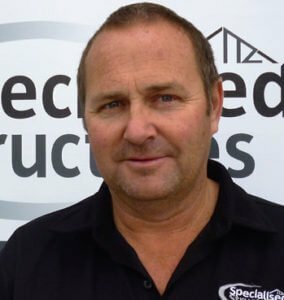 With 20 years of experience in the industry, you could say he has ‘had a crack at building most things’ including commercial, farm and residential building. We believe the greatest benefits of working with Specialised Structures is the flexibility in design, style and cost. 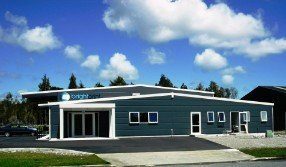 This, together with the team of draughtsmen and engineers, plus the network of Specialised Structures merchants with experience in all sorts of construction, means people are guaranteed a quality build, customised to their needs and built to last. 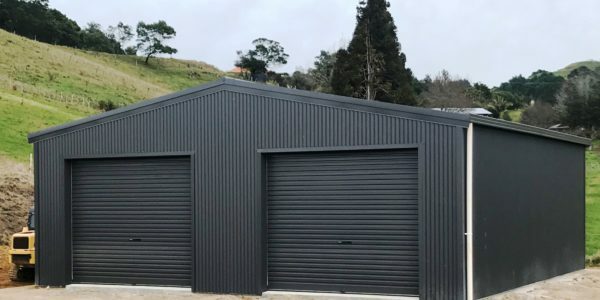 Providing customised steel building solutions to the following areas within Dunedin, Mosgiel, Milton, Balclutha, Middlemarch, Outram, Waikouaiti and the wider area. 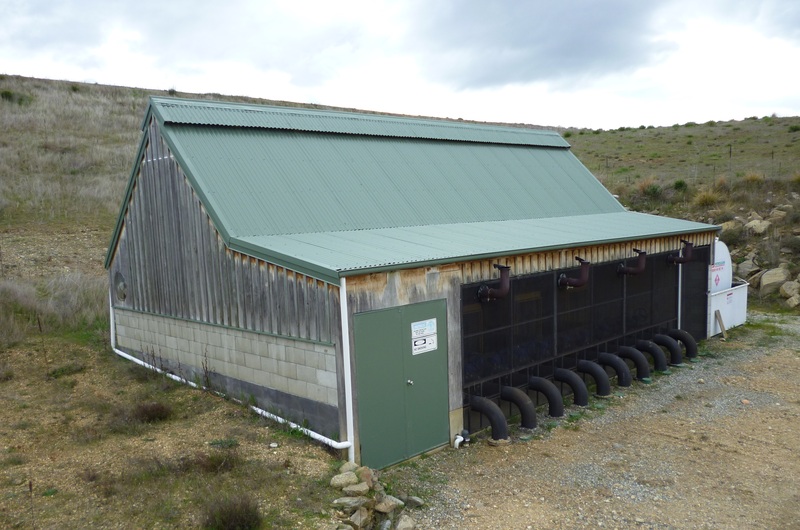 Chris has worked in the Otago region for over 20 years and has an excellent understanding of the challenges involved in the local environment. Chris is mad about motor racing, fishing and hunting, and is also a Motorsport NZ steward and driving standards observer. He also owns Smada Projects Ltd, undertaking the construction of new homes and excavation work. 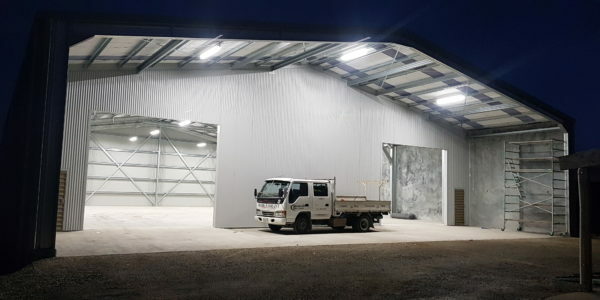 I especially like the fact that the Specialised Structures system uses quality materials from local suppliers to create robust and durable buildings of any size. 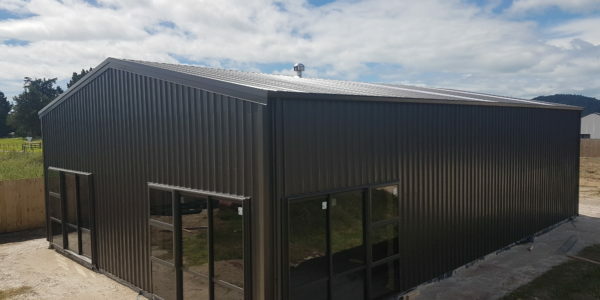 Providing customised steel building solutions within the Southland region; Invercargill, Bluff, Stewart Island, Gore, Winton, Riversdale, Wyndham, Lumsden, Te Anau, and the wider area. Keith’s been working and living in Southland all his life. He’s well known for his excellent project management, personally overseeing every project across his business portfolio. 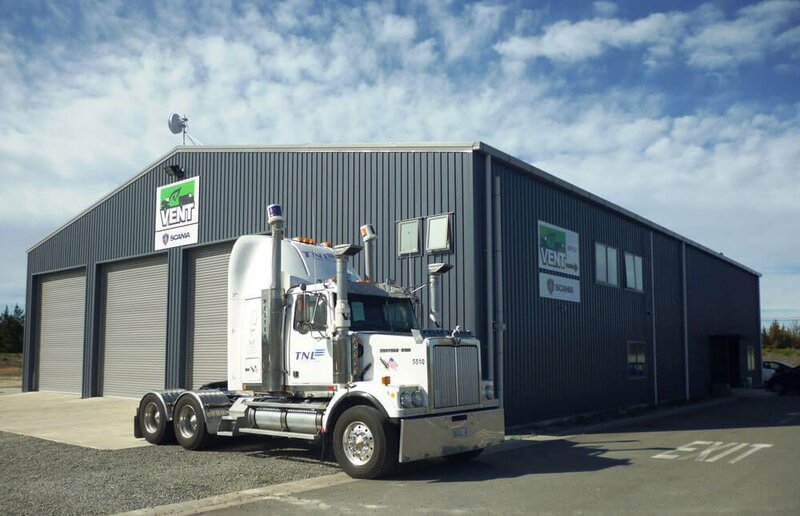 In addition to this, Keith operates the Skyline Buildings franchise in Invercargill and is also a qualified carpenter. His many hobbies include diving, hunting, fishing and motor-biking. He also sponsors Star Rugby club school boys and a local stock car. I bought a Specialised Structures license mainly for the ability to draw on the expertise of a nationwide network. I saw good value in the system too, particularly the ability to build something that was not only durable and fit for purpose, but a cost-effective option for our clients. 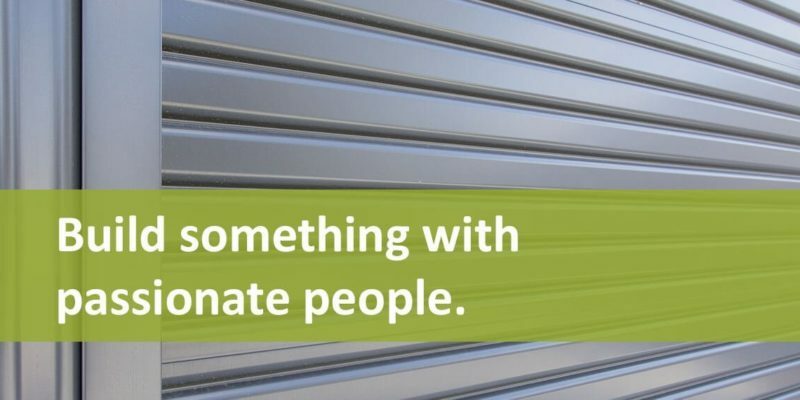 Find Out More About Joining Specialised Structures Today. Invest in, manage and grow a successful business with a Specialised Structures licence. Access to centralised supplies and better buying power. Plus, you’ll have support from our network of local business owners across New Zealand, who all want to see your company succeed! Use the form below to get in touch and request more information today. 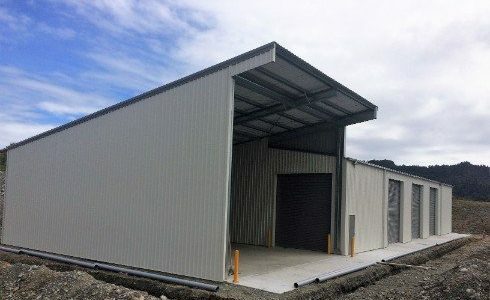 Kitset buildings are fast becoming a top do-it-yourself construction choice for many New Zealanders. The building option offers greater control, making it an affordable and faster way to build. 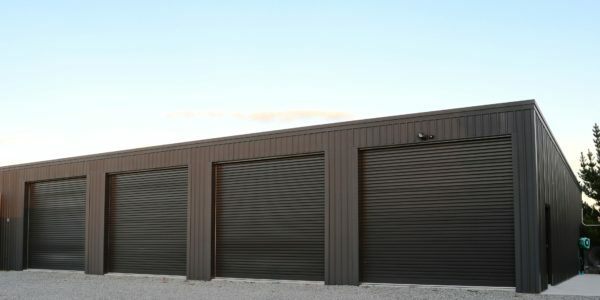 From kitset sheds and carports to large commercial projects, there’s a solution for almost every building requirement. 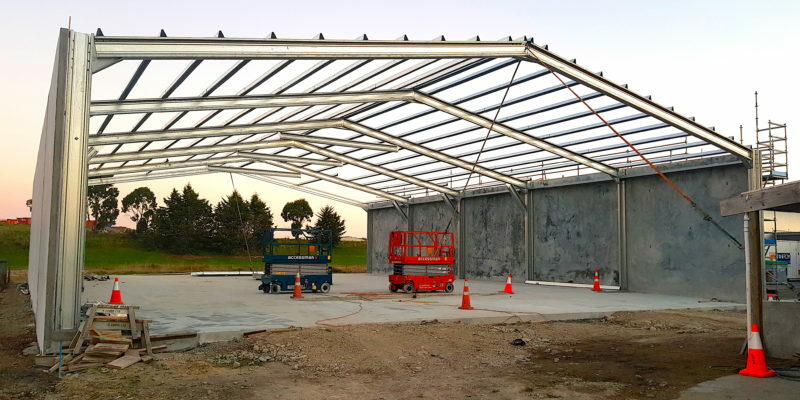 Many DIY savvy homeowners and forward-thinking businesses are turning to companies like Specialised Structures New Zealand for a wide range of commercial and lifestyle kitset buildings. It’s not hard to understand why! Here are some of the top reasons for choosing kitsets. 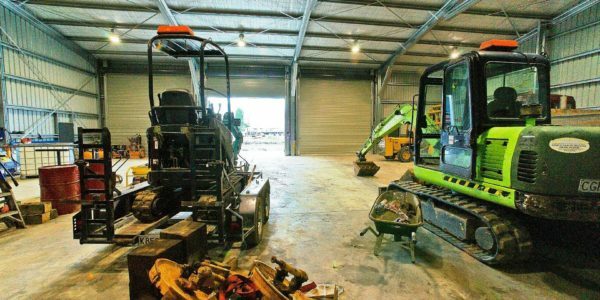 Top reasons to choose a kitset for your next building project. 1. You can manage as little or as much as you want. The most popular reason for building a kitset is that it gives you a pre-designed plan, for quick construction. Specialised Structures will provide you support and advice you need to ensure your project is a success. 2. Get help from existing contacts and networks. Kitset buildings make it easy to use your own friends, family and community to assist you. We can supply you, or your builder a construction pack with everything you need. 3. Use your own resources to reduce costs. Want to organise your own building resources? This benefit can significantly reduce the overall cost of your building project. 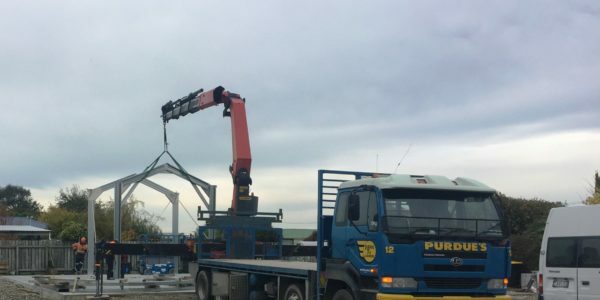 Plus, if you would like to erect the kitset just to the closed-in stage, Specialised Structures can also provide this option, giving you the opportunity to complete the interior yourself. 4. Work to your own time-frame. Go as fast or as slow as you like. No time spent waiting on labour or other constraints, or pressure to stick to a certain building schedule. You’re in complete control of your own timings from day one. 5. Choose from a range of building types. 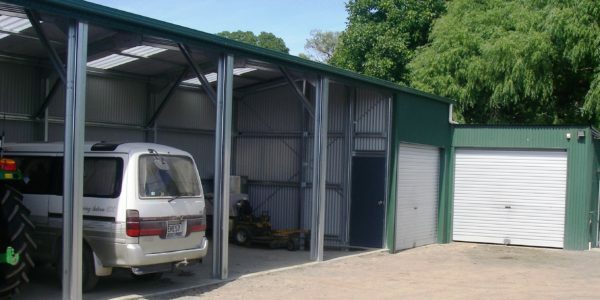 Your local Specialised Structures merchant can work with you to design the best kitset building or shed for your needs. Our in-house computer programme ‘Plan It’, makes it easy to design, engineer, and price the most economical solution for your building requirements. You’ll also benefit from the added aesthetic appeal which can easily add value to your commercial or residential property. 6. Have your construction pack delivered to your building site. Your building is supplied as a construction pack ready to assemble, complete with a construction manual so you can get started straight away. An added bonus, which can further reduce time on-site. 7. 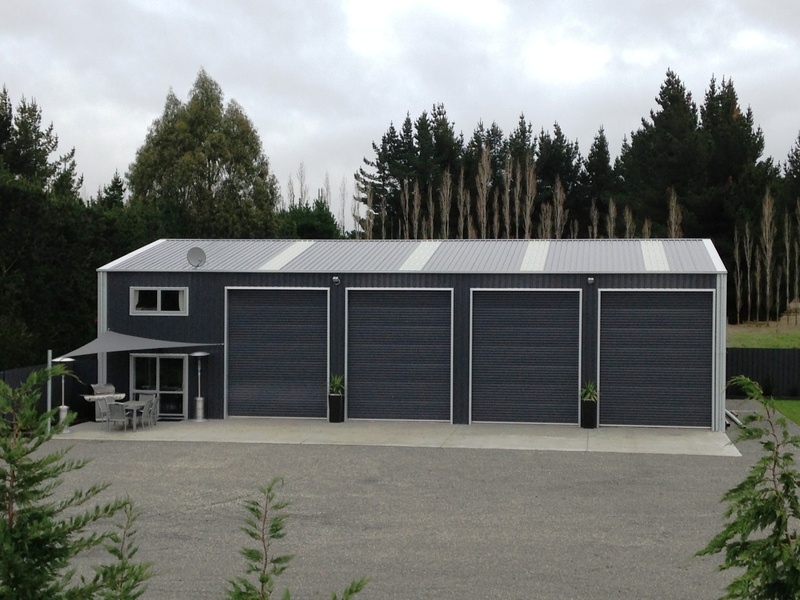 Choose from a range of New Zealand Designed, Engineered & Building Products. 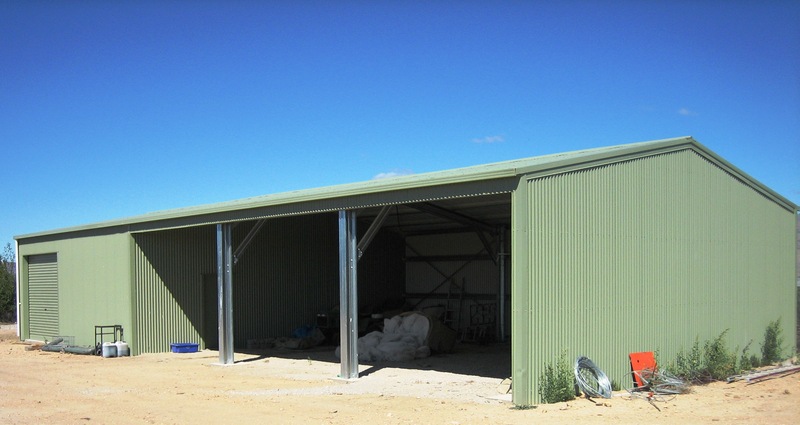 Specialised Structures is unique in offering pre-engineered customised portal framed kitset buildings. Made for New Zealand conditions, our products are durable, sustainable and covered by warranty. Cold-rolled steel is one very cost-effective and low-maintenance cladding choice. 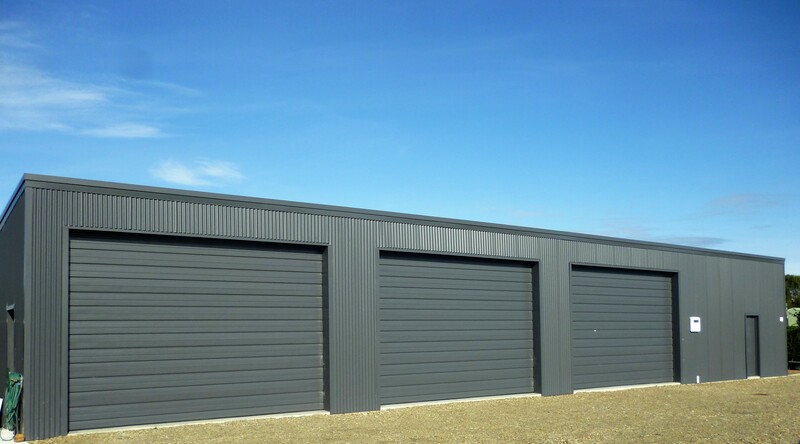 This option offers the added advantage of buildings screwed together, so dismantling for relocation or cost efficient expansion is simple. 8. Get support for a hassle-free consent process. We provide full assistance with the consent process, including relevant PS1 information. We can advise you on the building code compliance required for your project. 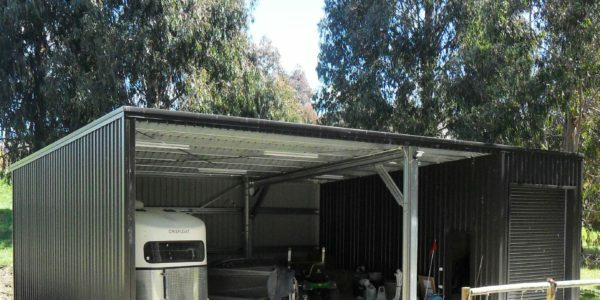 If it’s a carport you are after, keeping your build below the measurement of 20m2 means you do not need a consent at all! 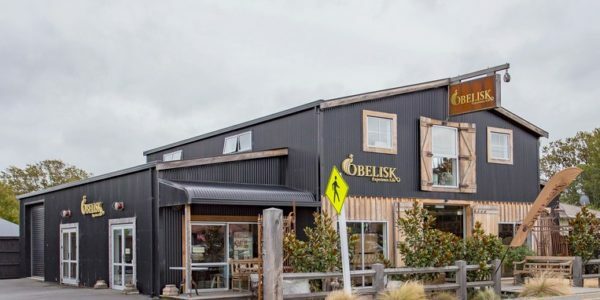 Kitset buildings are the ultimate match for New Zealand’s Do-it-Yourself culture. No project is too big or too small for a kitset! There’s a kitset for nearly every purpose. 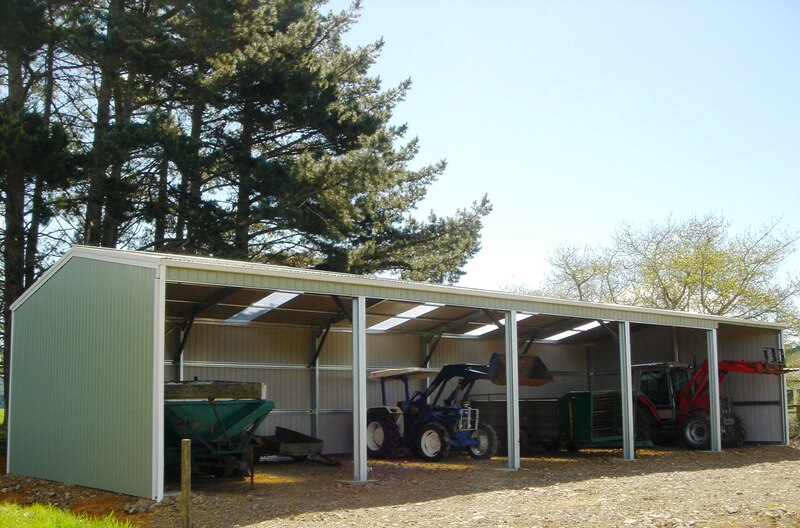 From farm sheds to large commercial or industrial buildings, to carports, sleepouts, garages and more. Chances are, you’ll find something which suits your building requirements. Download our Free Kitset Construction Brochure to see what you can build yourself. 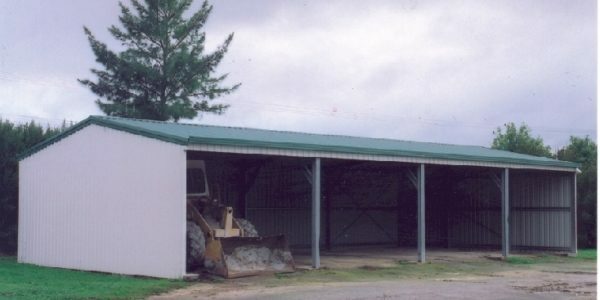 Work with your local kitset shed and building expert. 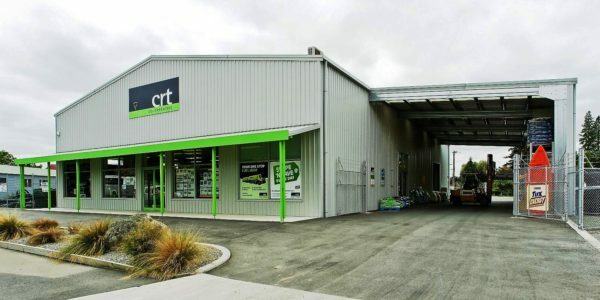 Specialised Structures New Zealand Merchants operate from Tauranga to Bluff! They are local experts with unparalleled experience in construction. 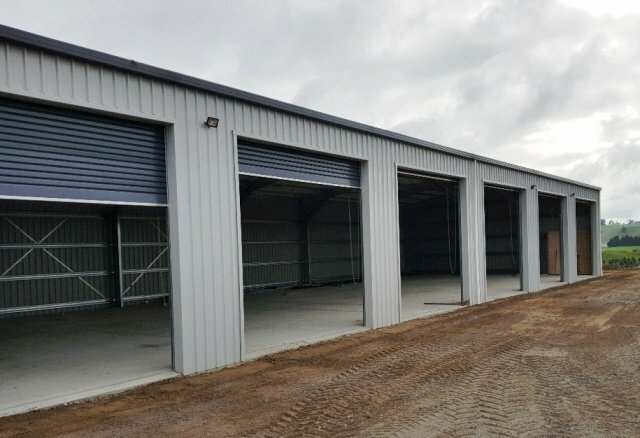 Each local merchant offers the Specialised Structures building system, which is unique in providing pre-engineered customised tailored solutions. They will work with you to give you the best advice on kitset buildings for your budget and requirements. Just building isn’t enough. We’re in the business of problem solving! If you need help with the set-up, design and pricing of your building project, get in touch to talk to someone who can assist you with available options. If you would like more information, we’re here to help. Find a merchant near you. 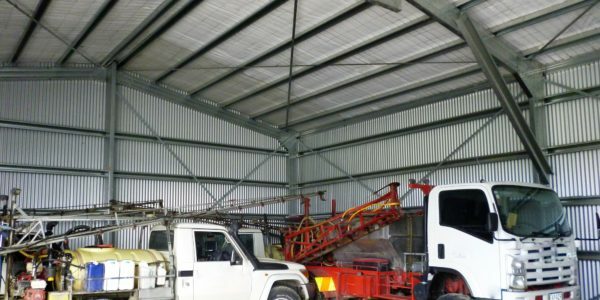 Everything you need to start building with Specialised Structures. Ready to get started? 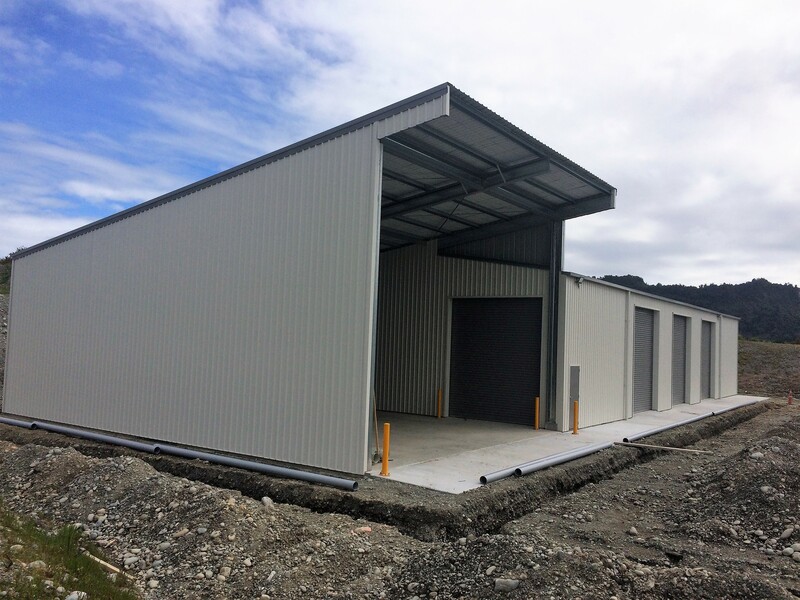 Kitset buildings or sheds are the perfect way to simplify the pricing and set-up phase of your construction project. Tell us a bit more about what you’d like to build, and we’ll do our best to find you the solution that fits your specifications, timeframe and budget. Take a look at our gallery of kitset shed and building ideas for inspiration, and get in touch if you would like to learn more. Simply Freephone 0508 787 828, or contact us online to tell us more about your requirements. What would you build, if you could build it yourself? 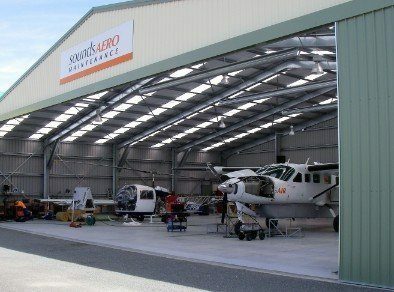 Specialised Structures – more than just big sheds! 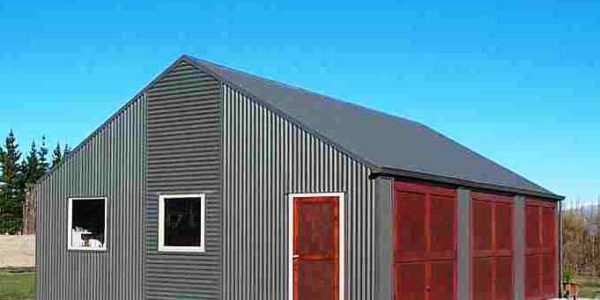 We’d love to hear about your dream shed or building project. If you have something in mind that you’d like a kitset price for, get in touch today to chat with your local building expert. Tell us what you would like to build today. 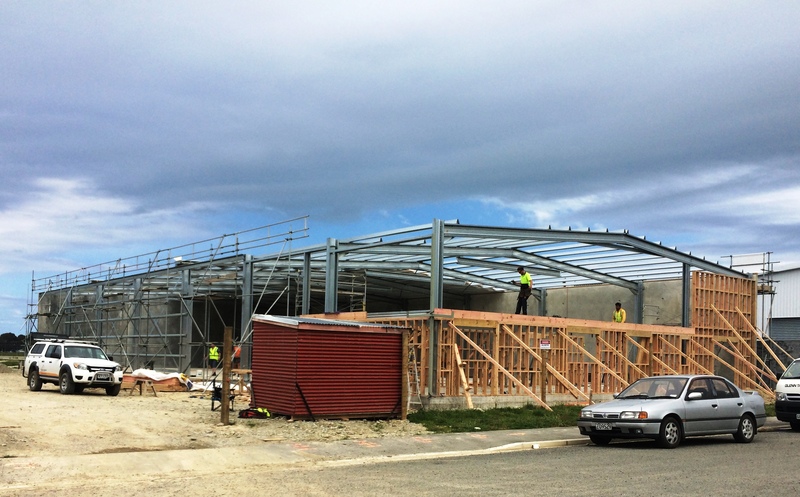 We’re pleased to bring you the latest building construction update from Specialised Structures. 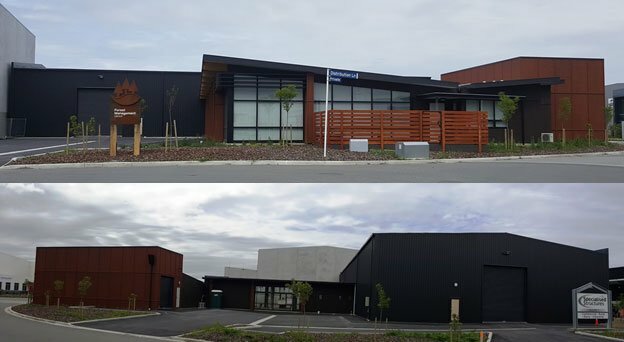 In this post we feature construction highlights from projects recently completed, or near-completion from Southland to Central Plateau. It showcases the great range of building projects our team has been working on, plus an update on the Southland lifestyle barn we featured in our previous news update. 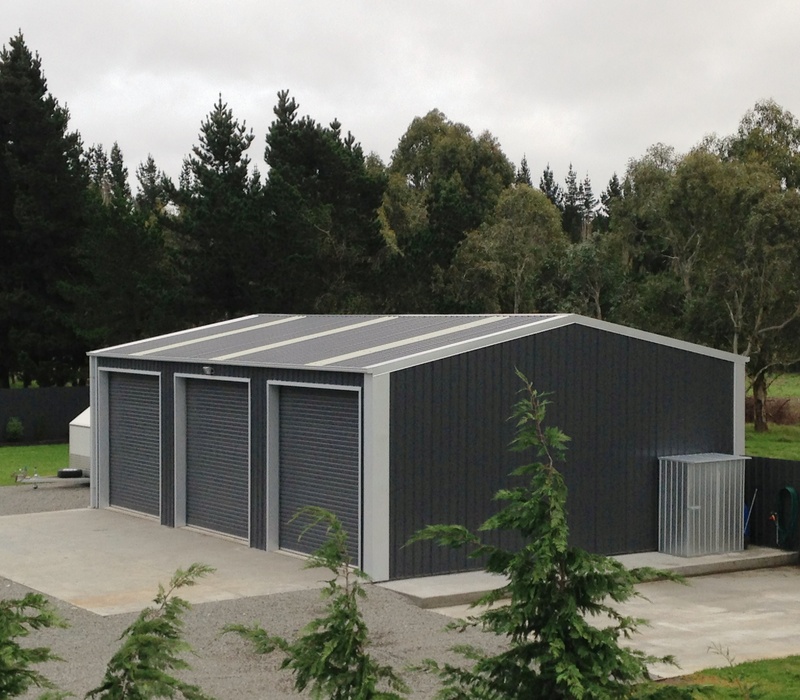 Specialised Structures materials are New Zealand sourced and designed and engineered for all conditions. That’s a point of difference we’re extremely proud of. Take a look and see if you can pick out the range materials used for fast construction, weather-proofing, fire-resistance, cost-effective and durable, high-quality builds. 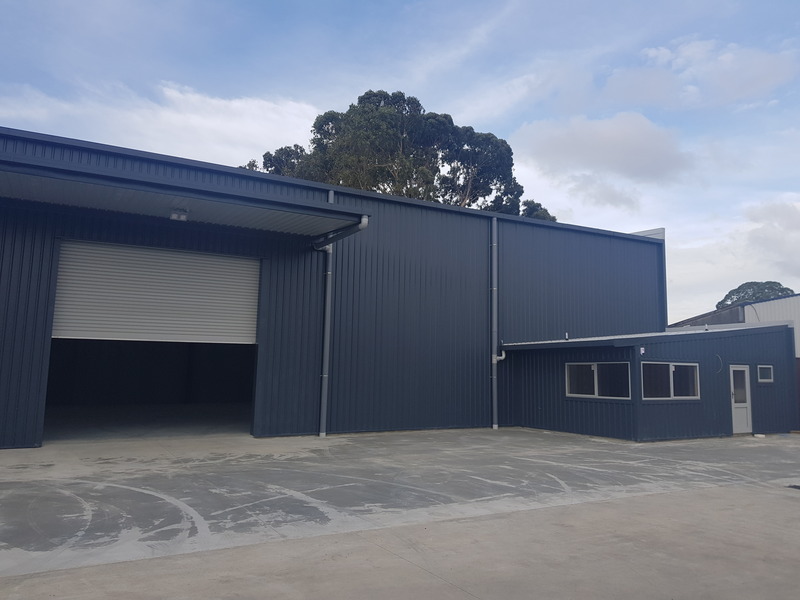 The owners of this smart-looking storage warehouse in Timaru are thrilled with their new build, thanks to the work of Mark Farrant and his team at Specialised Structures South Canterbury. 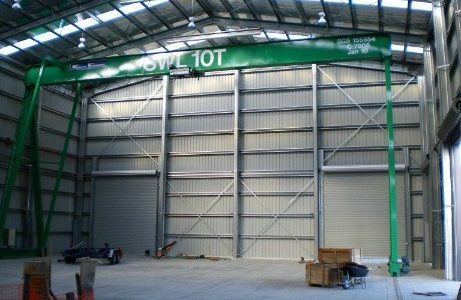 This building has a 23m span, 30m long, with a poured area of 420m2. 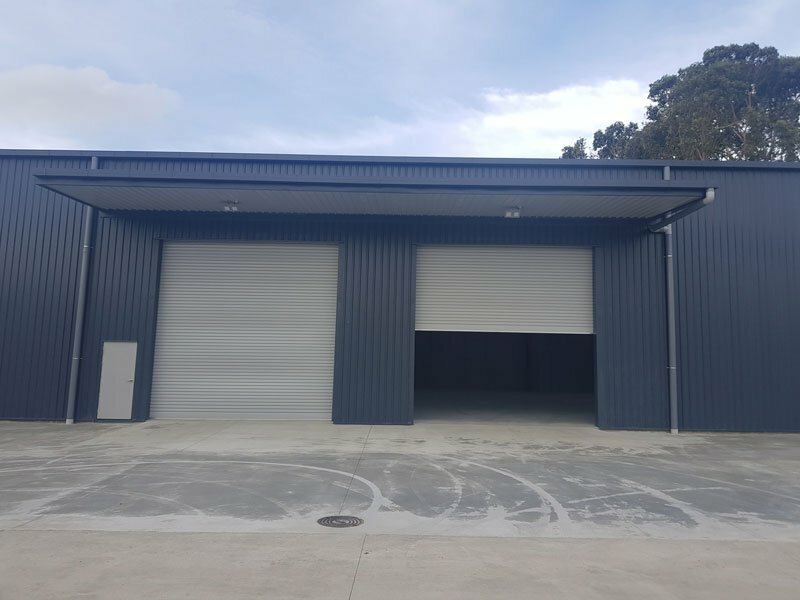 With 552m2 of storage and a 6m x 23m (138m2) covered loading bay and features 6m tall tilt slab walls to neighbouring boundaries for fire protection. 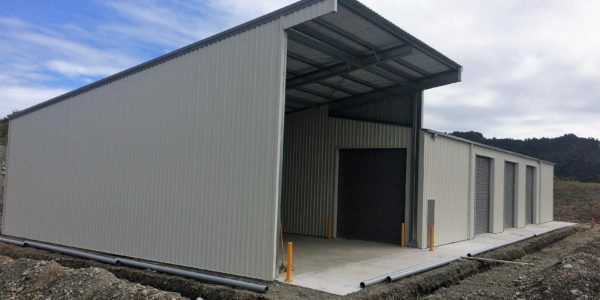 Specialised Structures Central Plateau have recently finished their shed build in Reporoa. 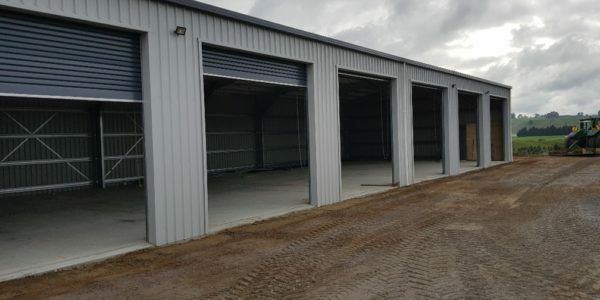 Dimensions are 30m x 12m with 6 x motorised roller doors. The shed is cladded with Plumdek colorsteel, Gull Grey and New Denim Blue are the colours. 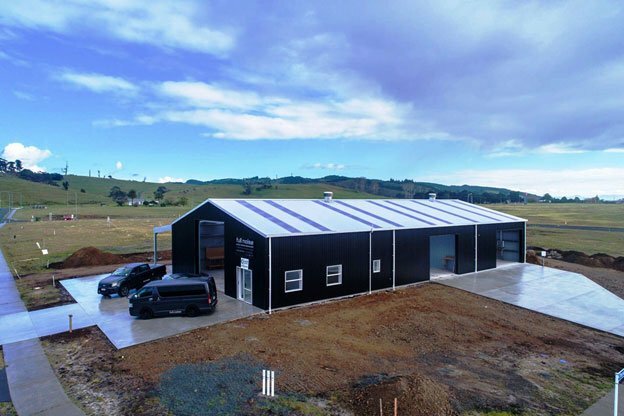 Keith McLeod and his team at Specialised Structures Invercargill have progress in the construction of this lifestyle barn, which featured in our previous update. This barn house features one bedroom, lounge, shower, two toilets, dining and kitchen. 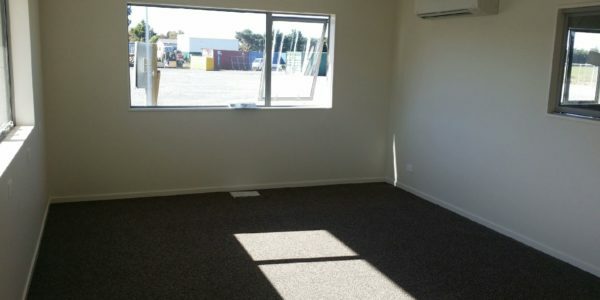 At 14m x 13m, there’s plenty of room to house a motorhome, and park some cars inside as well! 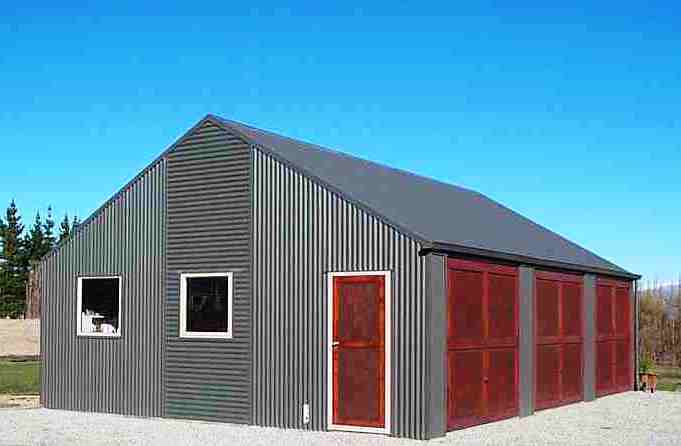 The Kiwi barn style house has become a must for many with lifestyle blocks,. Providing people with living quarters (barns with accommodation), extended garage and storage space. Learn more about our all-purpose Lifestyle Barns. 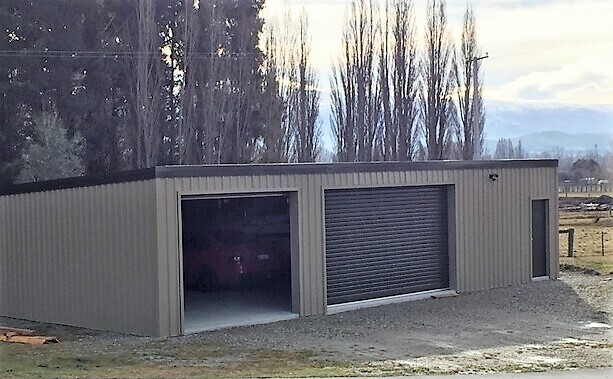 Justin Quaid and his team at Specialised Structures Mid Canterbury have completed this customised building project for a local transport company. 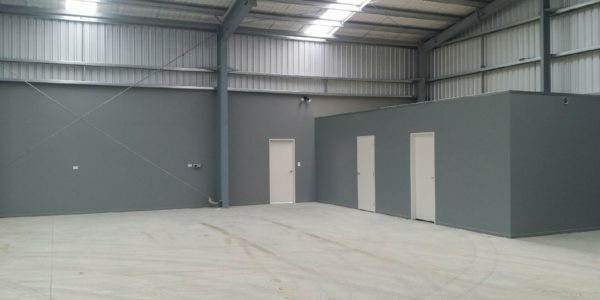 Dimensions are 1200m2, and 45m x 24.7m x 5.5 knee height including the reception and office, plus 2 x additional offices, smoko room, locker room and bathroom. 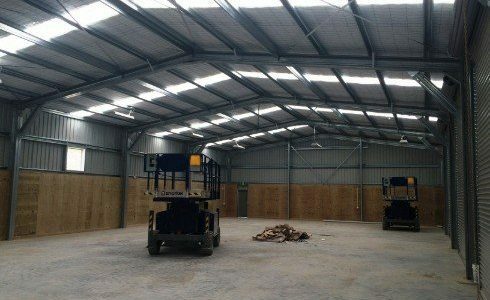 Specialised Structures can provide cost-effective and customised solutions to suit a wide range of commercial building projects. 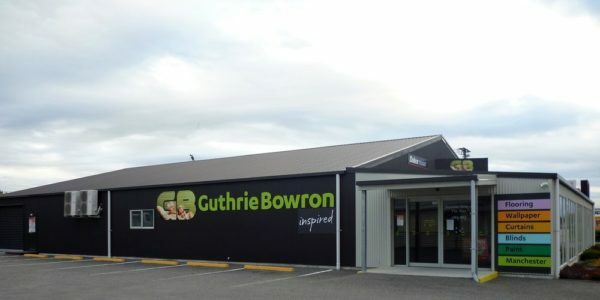 To find out more about our commercial building solutions. 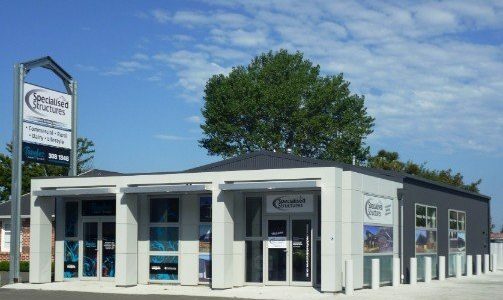 Rock Control, in Woolston, Christchurch have a smart-looking office block thanks to Luke Anderson and his team at Specialised Structures Christchurch. 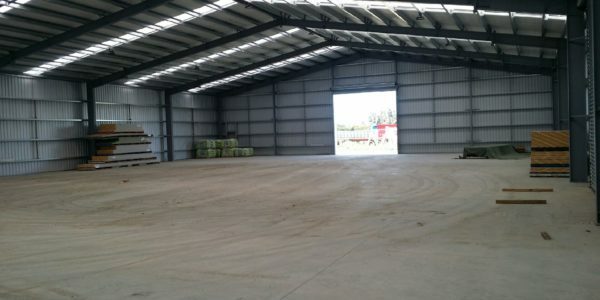 A 900m2 warehouse with 200 m2 office block, this building is 50m long x 20m span x 5.7m knee height. 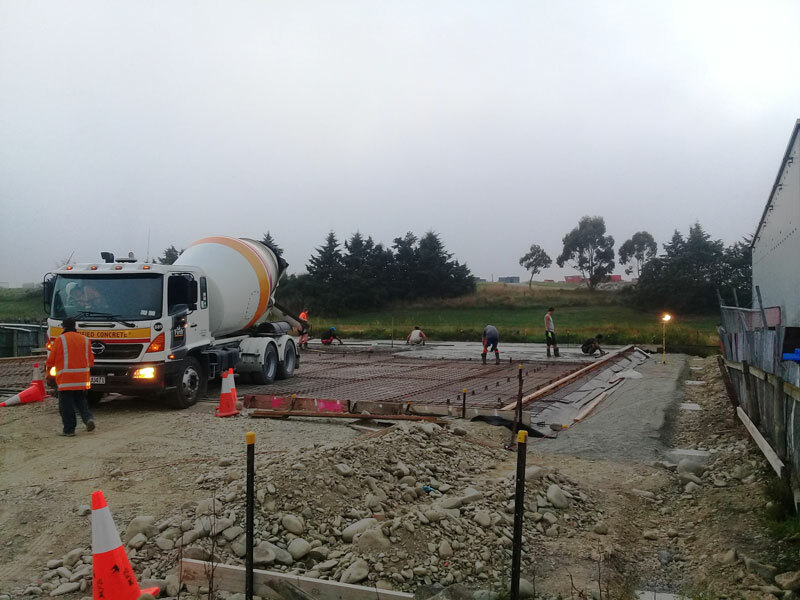 The strength, quality and the ability to customise a building to fit a particular purpose is what initially encouraged Luke and Eric Anderson to come on board with Specialised Structures New Zealand. 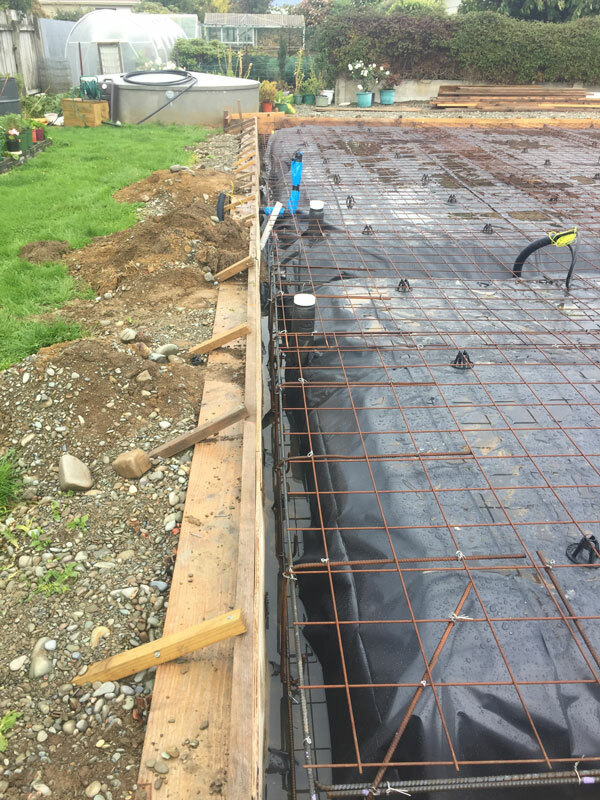 With 15 years plus experience in construction, Anderson Construction are Licensed Building Practitioners and members of Site Safe. If you need to request an estimate for a commercial office block or building, contact one of our Specialised Structures teams to find discuss your requirements today. 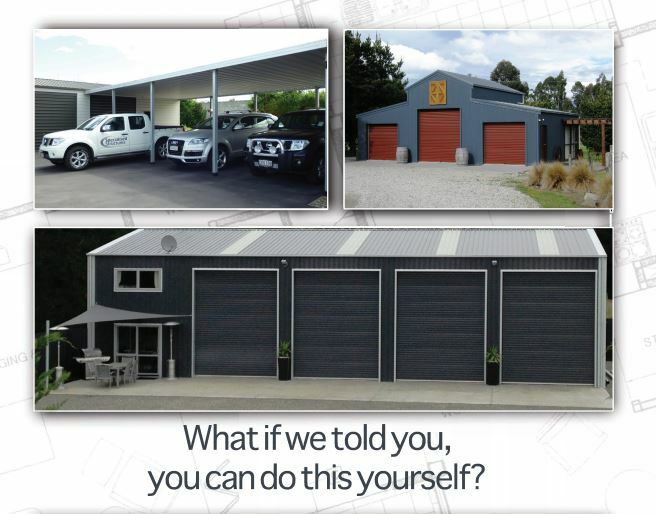 At Specialised Structures New Zealand we build more than just big sheds! 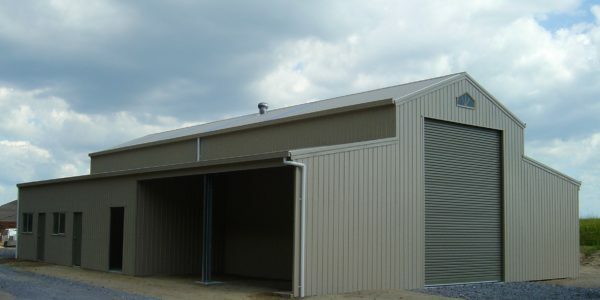 We also build Commercial, Industrial, Warehouses, Offices, Storage & garages. With branches across the country, our team are locally experienced and skilled in building for all conditions. Our people have access to the tools to build to any specifications. 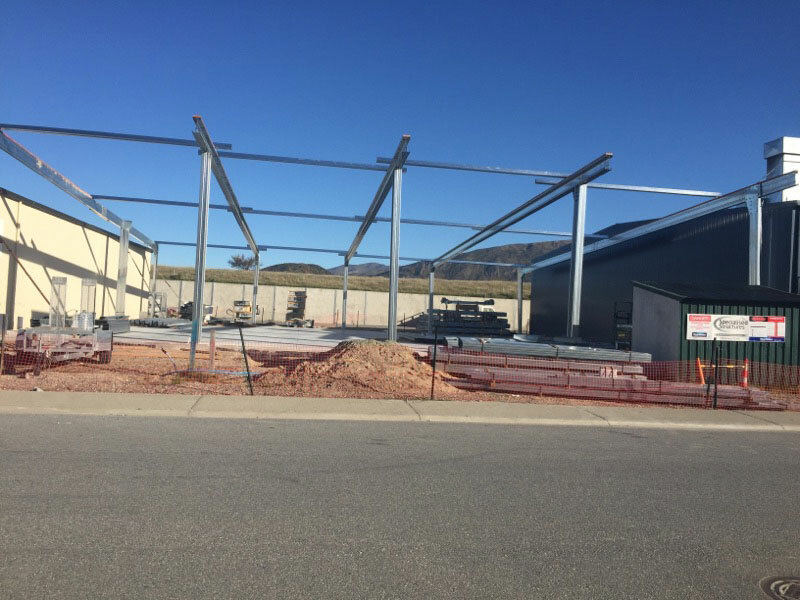 We integrate a multitude of construction methods and work with a variety of materials, including structural steel, tilt slab, cold-rolled high tensile steel and timber. 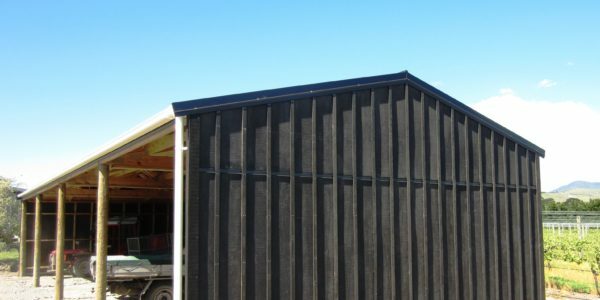 Materials can be tailored to suit your specifications, whether you’re looking for something that is Energy Efficient, Weatherproof Birdproof, Fire Resistant, Speed of Construction, Design Versatility, Sustainable, Cost Effective and Quality Guarantee. 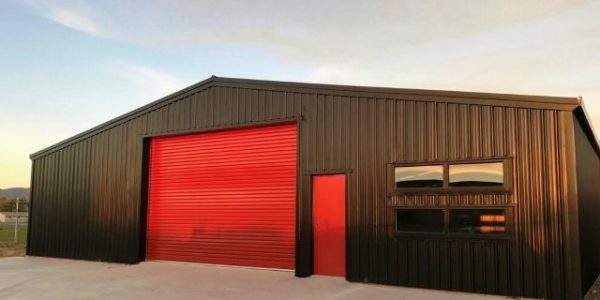 We can advise on the best materials for your requirements, taking into account terrain, snow loads, wind and earthquake and even fire protection in your project. If you’re looking to build for energy efficiency, need a speedy turnaround or require something sustainable and cost-effective, we can make your construction progress move forward hassle-free this winter. Contact us about your next building project today or freephone us now on 0508 787 828. We look forward to building with you! The days on site may be getting cooler, but there’s no sign of the workload cooling off! 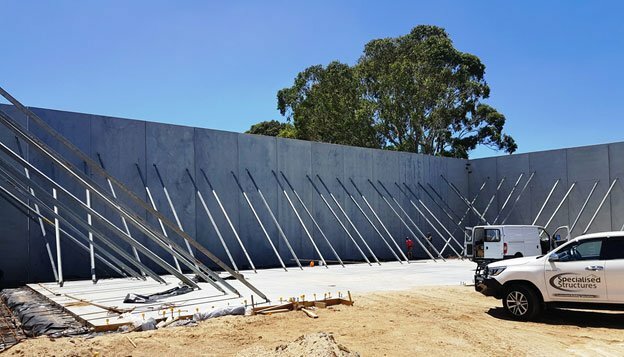 In this construction update we use some of our recent building projects to highlight the versatility and benefits that come when you build with Specialised Structures. Our latest construction projects help to demonstrate the great range of variety and quality available with our range of building options. 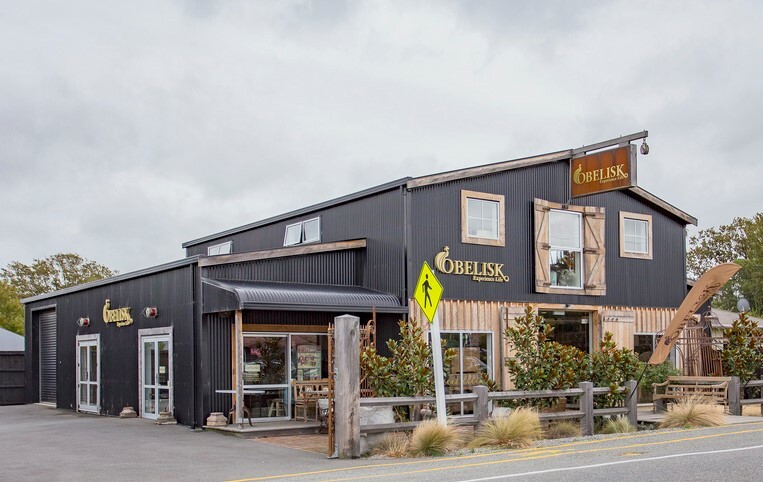 You’ll find everything from barns built to suit the ultimate in lifestyle requirements, to custom built commercial builds, cost-friendly industrial warehouses and unique home builds. These five examples of new buildings showcase some of the exciting range of projects happening across our network this month. 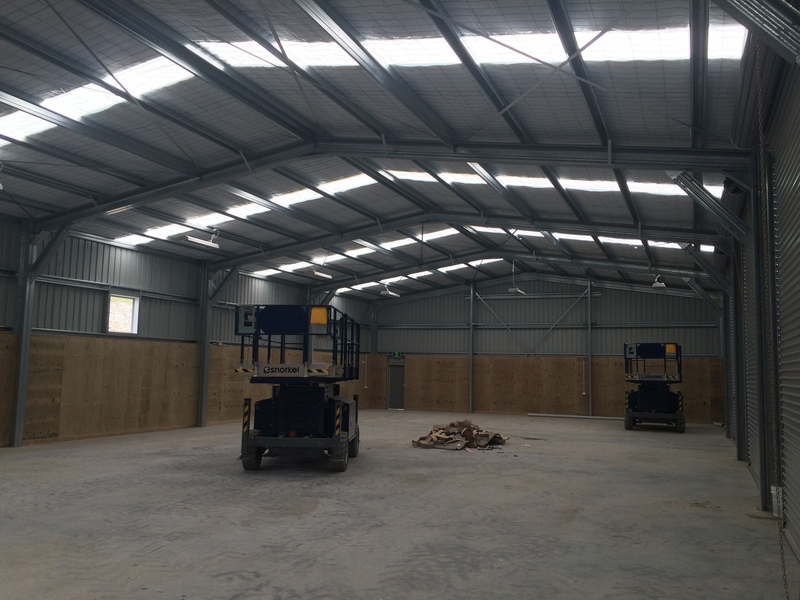 The 660m2 warehouse and office warehouse featured in our previous news blog is almost complete. 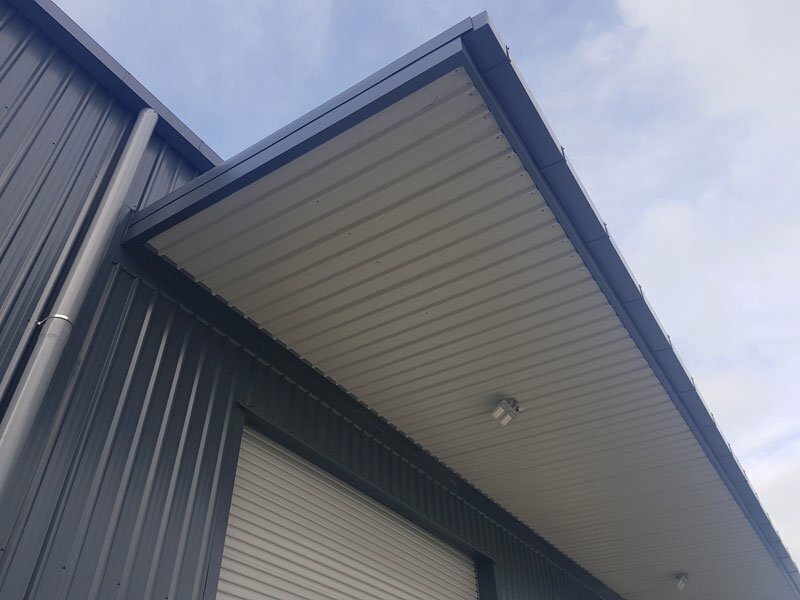 Located on Vickery Street in Hamilton, the structural steel and cladding for this building was supplied as a kit by Andrew & Leigh Thompson of Specialised Structures Waikato. 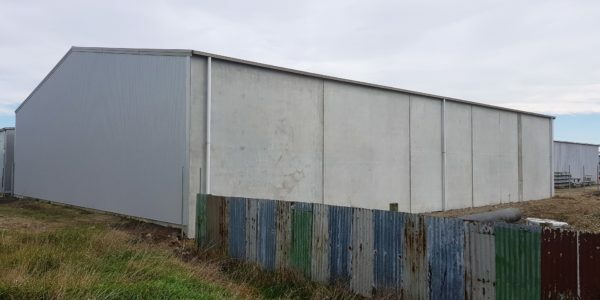 This building includes 3 sides of concrete tilt panel a structural steel frame, coloursteel cladding to roof and front façade, and is an excellent example of the wide range of high quality materials, sourced at a good price – a key benefit of working with us. 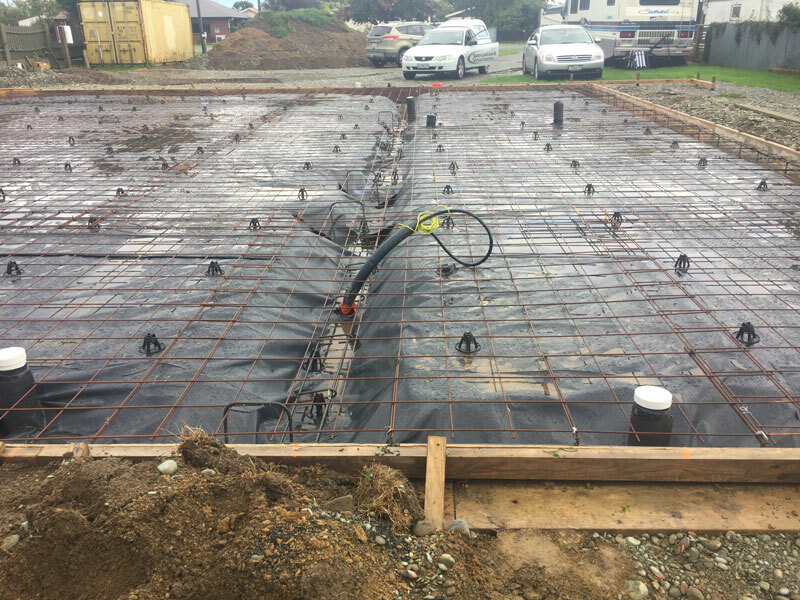 The floor is ready to have concrete poured on this versatile new lifestyle barn in Wallacetown, Southland. 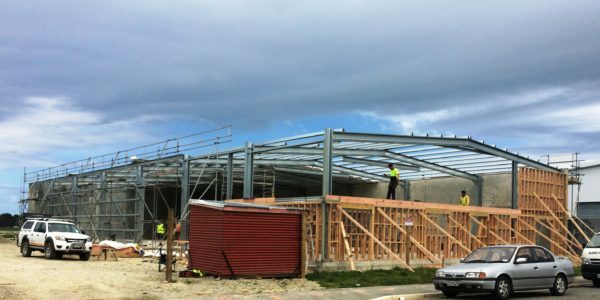 The latest from Keith McLeod and his team at Specialised Structures, Invercargill. This barn house features one bedroom, lounge, shower, two toilets, dining and kitchen. 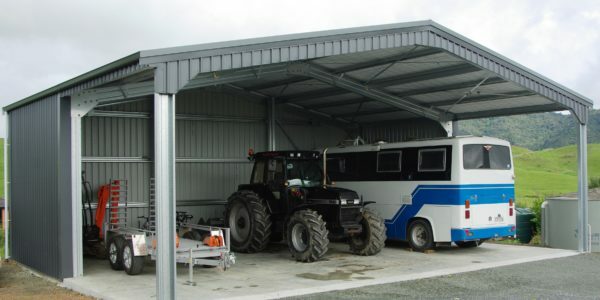 At 14m x 13m, there’s plenty of room to house a motorhome, and park some cars inside as well! 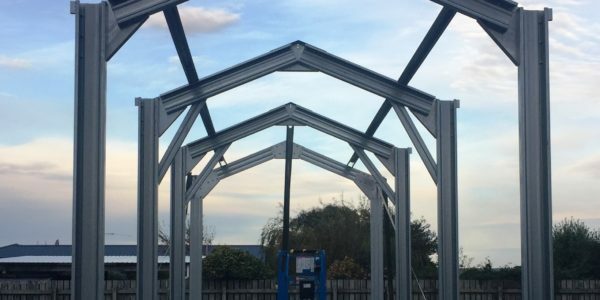 If you’re looking for something a little different, you’re in good hands with your local Specialised Structures merchant. 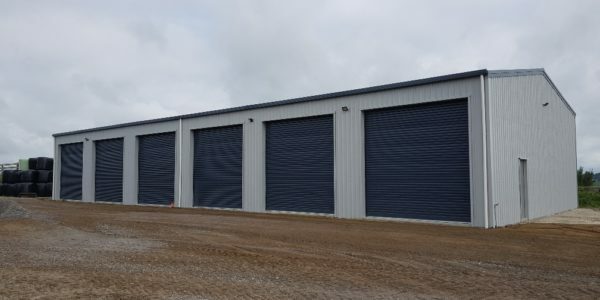 No requirement is too big or too small, and this build is a great example of something purpose built to meet the needs of this client. 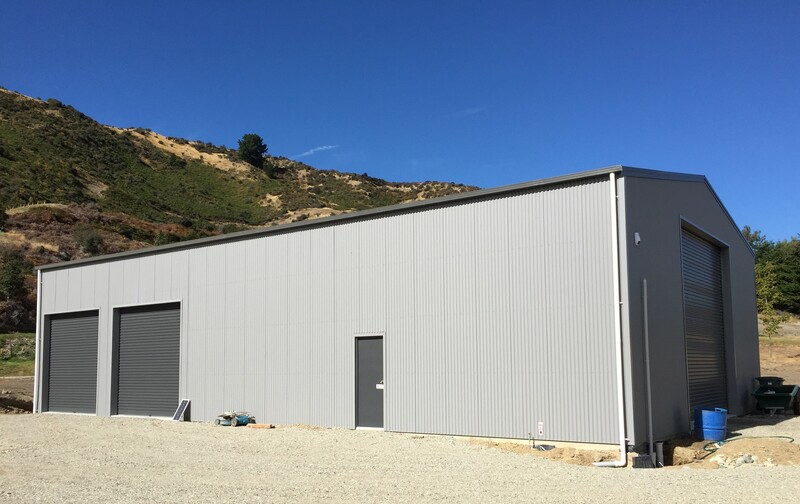 Mark Farrant and his Specialised Structures South Canterbury team are currently building this 690m2 Storage Warehouse in Timaru. 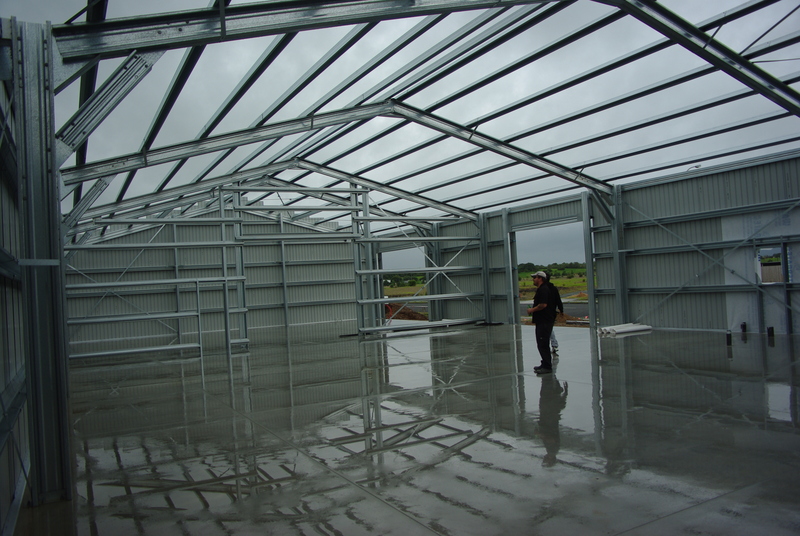 This building has a 23m span, 30m long, with a poured area of 420m2. 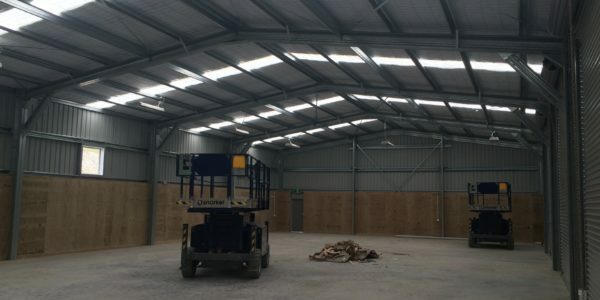 With 552m2 of storage and a 6m x 23m (138m2) covered loading bay, and features 6m tall tilt slab walls to neighbouring boundaries for fire protection. 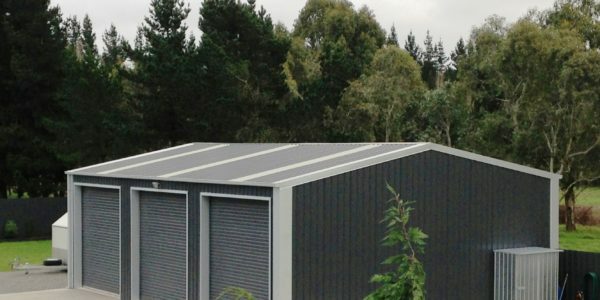 Each of our buildings are engineered specifically to the site requirements and environmental concerns, taking into account terrain, snow loads, wind and earthquake and even fire protection – built to withstand your unique local conditions. 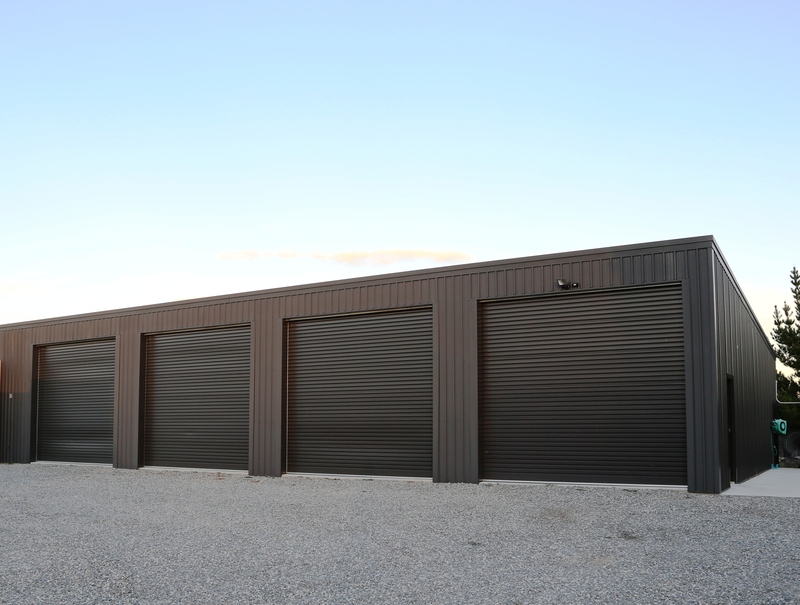 Learn more about our Commercial and Industrial Building solutions now. 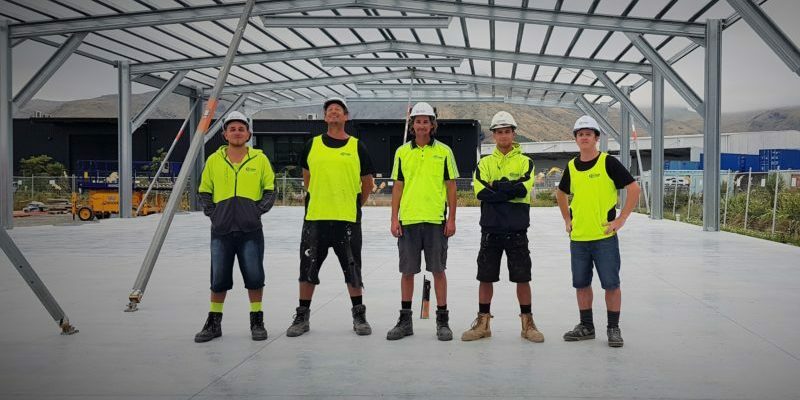 Greg McDowall and his team at Specialised Structures Central Otago are currently building this 23m x 23.5m mono pitch shed in Wanaka. 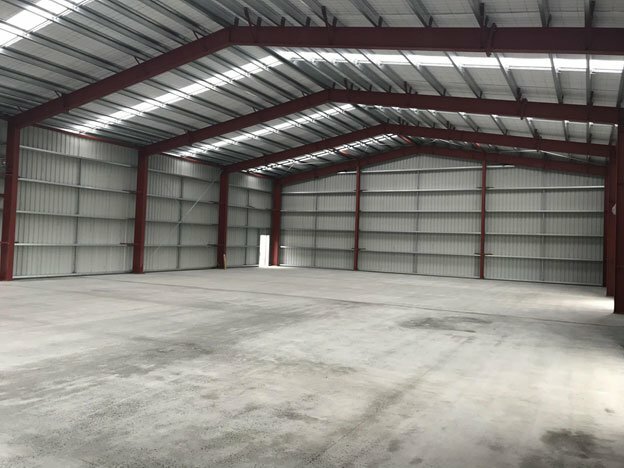 Custom-built to client specifications, not only will it house two workshops, it will feature two showrooms and two apartments set on a mezzanine floor. The structure will be cladded with speedwall and stria board, and topped off with Coloursteel ebony plumbdeck. 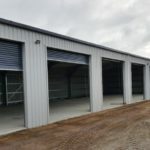 Our latest building highlights demonstrate five key reasons why Specialised Structures is an excellent choice both for our versatility, variety and quality. We can take care of the whole building process for you, from concept to completion. We look after design, engineering, council consents and the actual construction of your building. Alternatively we can work with your chosen architect or builder. 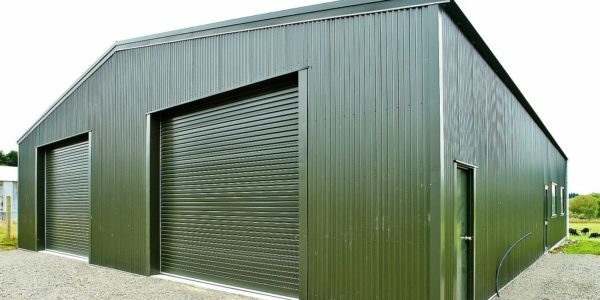 Each of our buildings are engineered specifically to the site requirements, taking into account terrain, snow loads, wind and earthquake demands – built to withstand your local conditions. We only deliver quality. And our reputation depends on it. Let’s get the ball rolling with a few details about what you need this building for, and what you think you might want in the way of features. We’ll get back to you with an indicative estimate. Get an estimate for your next building project online now or Freephone 0508 787 828. Construction highlights from a busy Summer! 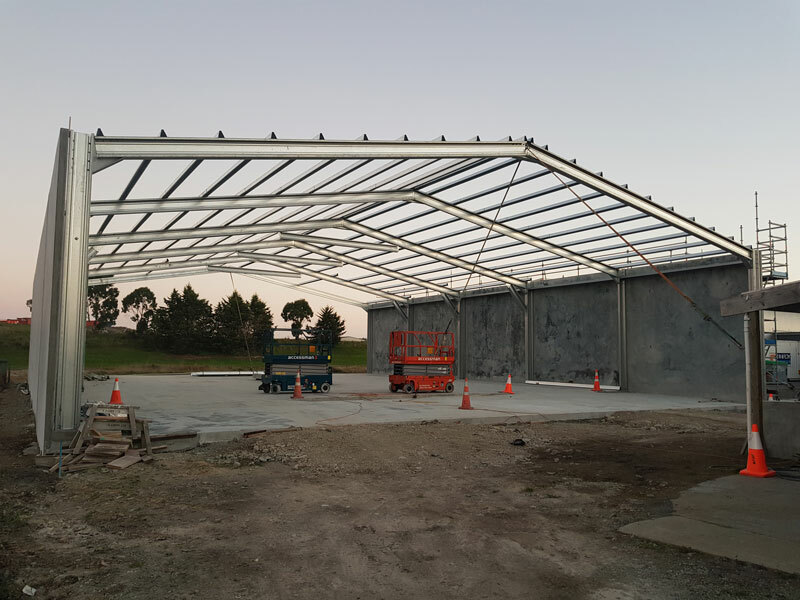 It’s been a busy few months here at Specialised Structures New Zealand, now we are in Autumn there appears to be no signs of slowing down! Throughout the country our hard-working team of construction professionals have been working on a diverse range of Industrial and Commercial buildings. Here are five of our construction highlights from recent months. 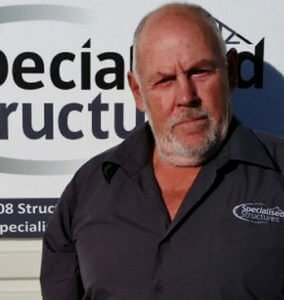 If you’ve been following the Specialised Structures Facebook Page, you may have noticed recent updates on the McLellan’s Showroom underway from Greg McDowall and the team at Specialised Structures Central Otago, or the remarkable distribution building for Chunky Dog Foods from Andrew Templer and the team at Specialised Structures Tauranga. 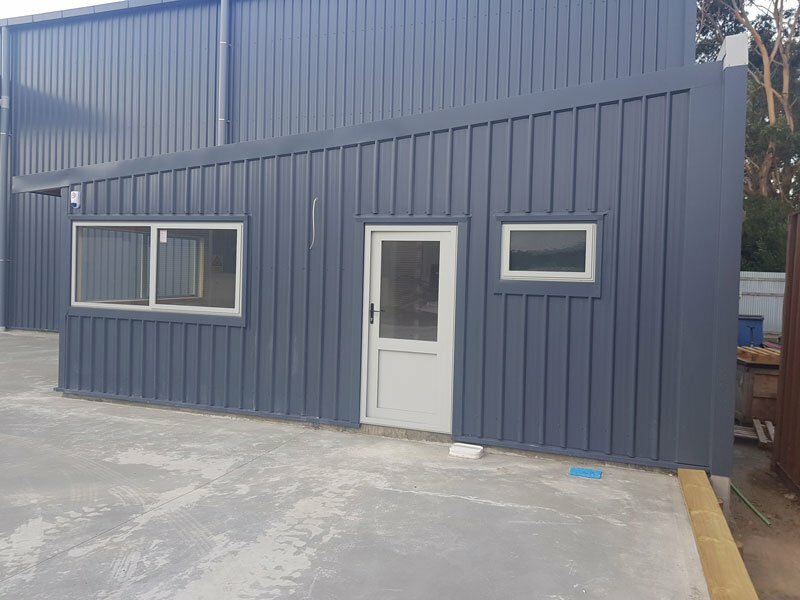 In this news blog we feature both projects, plus three more smart looking buildings recently completed, or near completion. 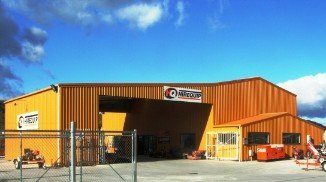 This 660m2 warehouse and office is on-the-go in Te Rapa, Hamilton. 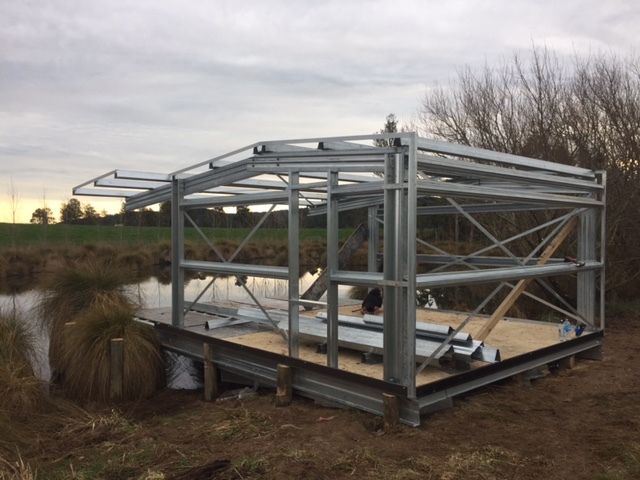 Structural steel and cladding supplied as a kit for the construction by Andrew & Leigh Thompson of Specialised Structures Waikato. The building includes 3 sides of concrete tilt panel, structural steel frame and colorsteel cladding to the roof and front facade. 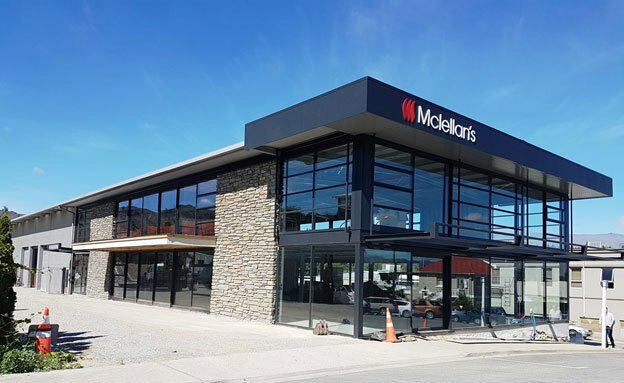 Greg, and the team at Specialised Structures Central Otago have been working hard to complete this 392m2 Showroom for McLellan’s in Alexandra. And what a show piece building it is! Exterior almost complete, now for the interior! 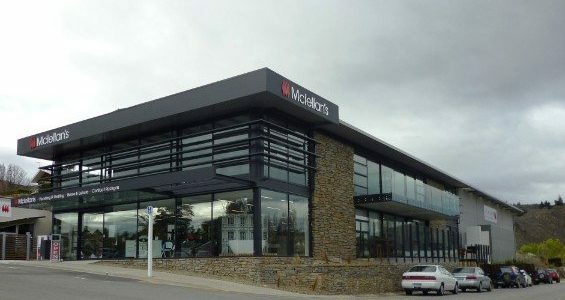 The exterior of McLellan’s Showroom is almost finished. Interior will include polished floors and underfloor heating. 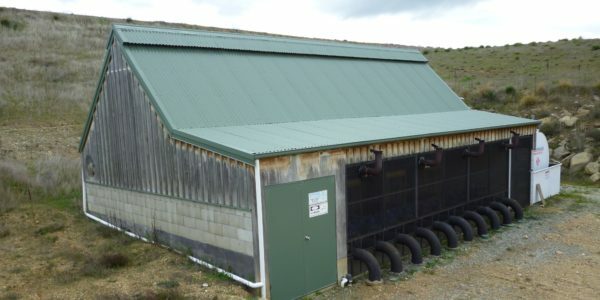 A design feature on the exterior being the use of Central Otago schist to match the local landscape. 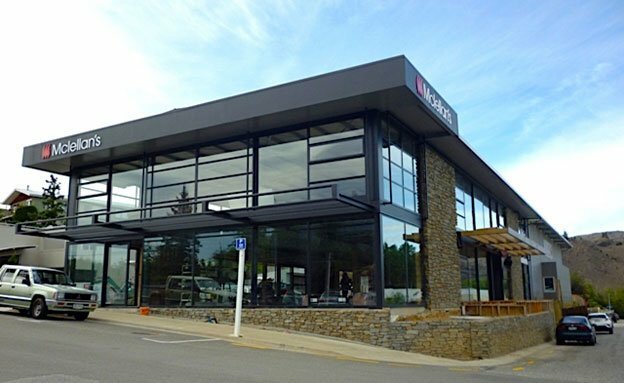 This commercial project is from Luke Anderson – Specialised Structures Christchurch and North Canterbury. 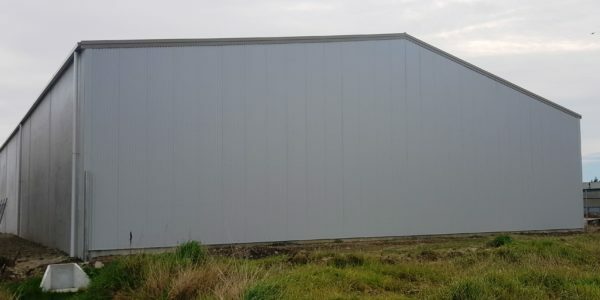 One feature of note in this structure – tilt panel firewalls to two sides in the main Warehouse. An extremely smart looking building which meets the needs of two tenancies. 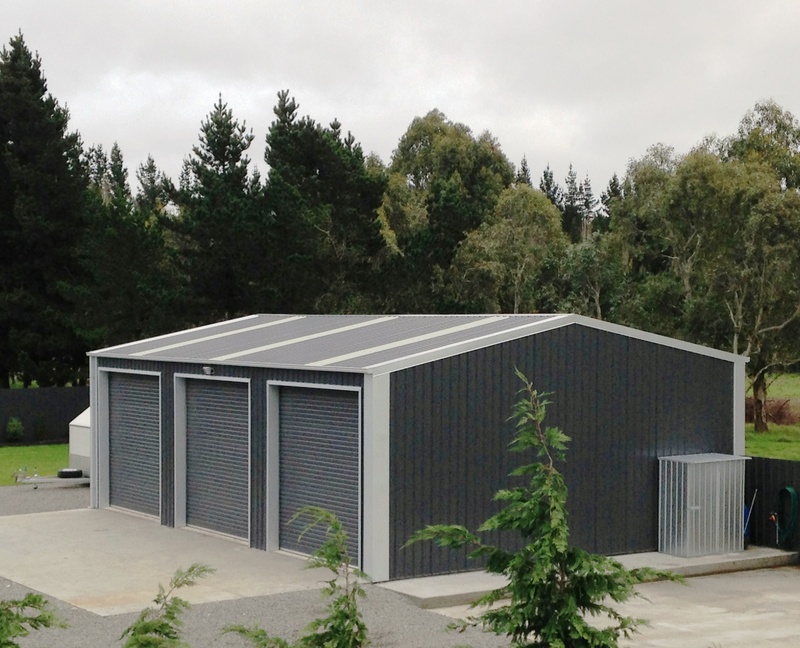 The first has the 450m2 office which has a forest management company in it. 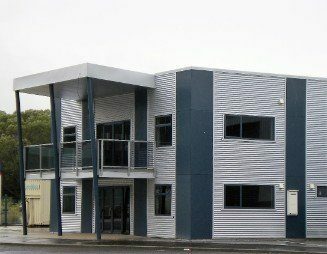 The other has 200m2 office with 1075m2 Warehouse attached which a plastics company occupies. 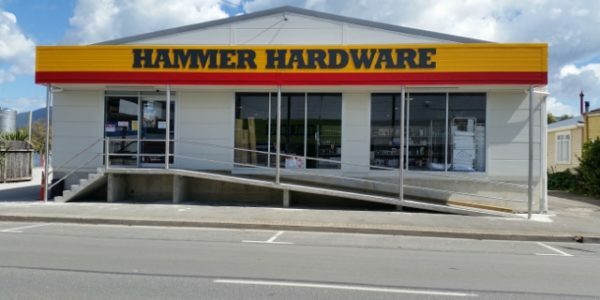 Located at Marsden City, Ruakaka, Northland. This remarkable building is used for a Panel beating workshop. 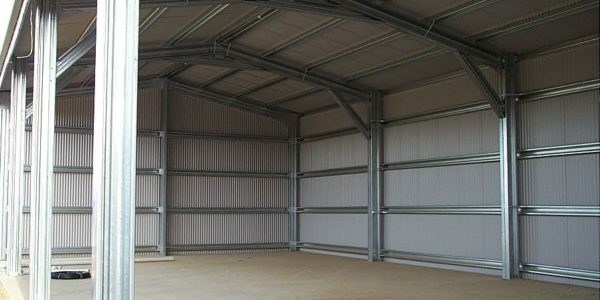 Measurements are: 30m long x 15m span x 5m span lean to x 13.5m long. 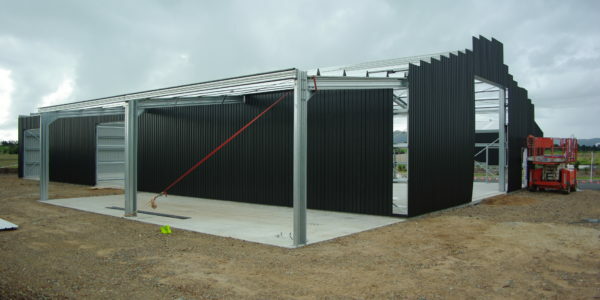 Design features include Ebony walls and a Zinc roof which is suited to the Northland sunshine. 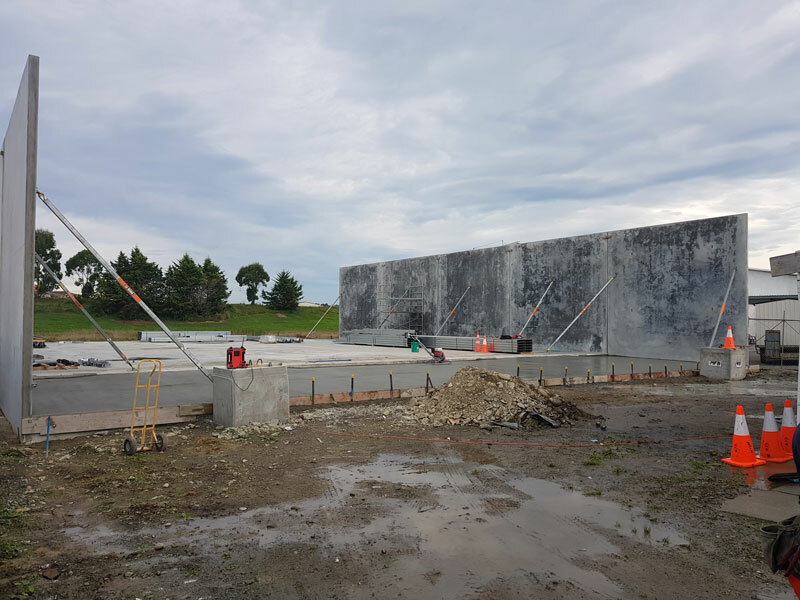 This is a distribution building for Chunky Dog Foods being built in Paeroa by Andrew Templer and his team at Specialised Structures Tauranga. 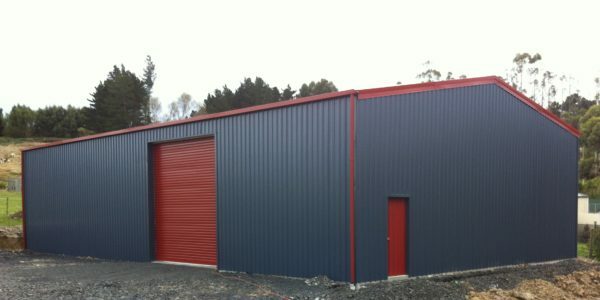 The colour is Pioneer Red, and the building is 30m long, 20m wide and 4.5m high. 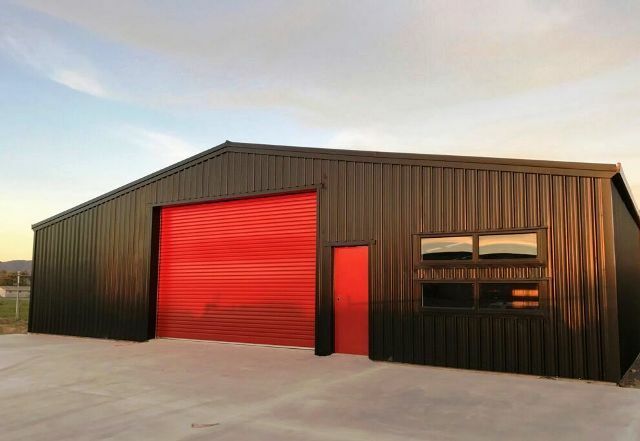 Like the look of these Commercial and Industrial builds? 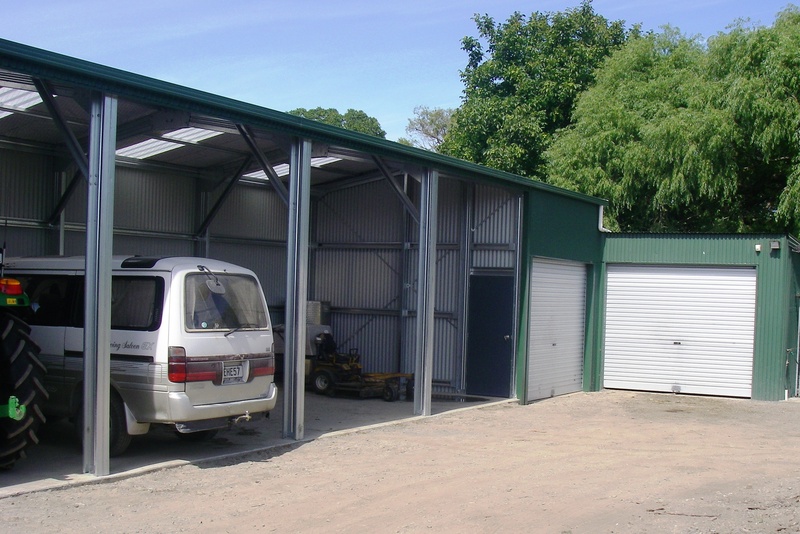 Request an estimate for your own Specialised Structures building today. Specialised Structures are the experts at supplying and constructing custom buildings to meet your vision and budget. 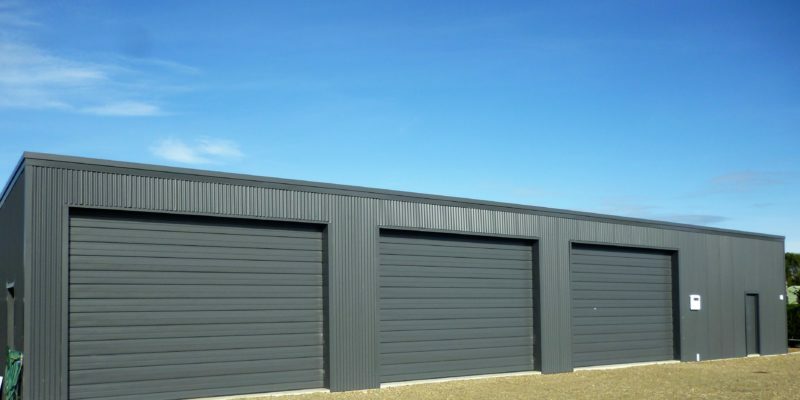 With merchant locations around the country we have solutions for any size building project. 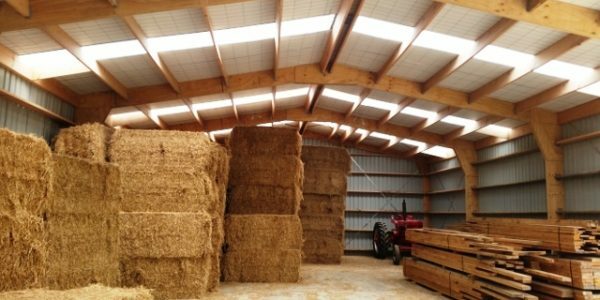 Our resources enable us to offer both quality and value for money from large scale industrial, commercial and farm buildings to smaller scale lifestyle and home buildings. 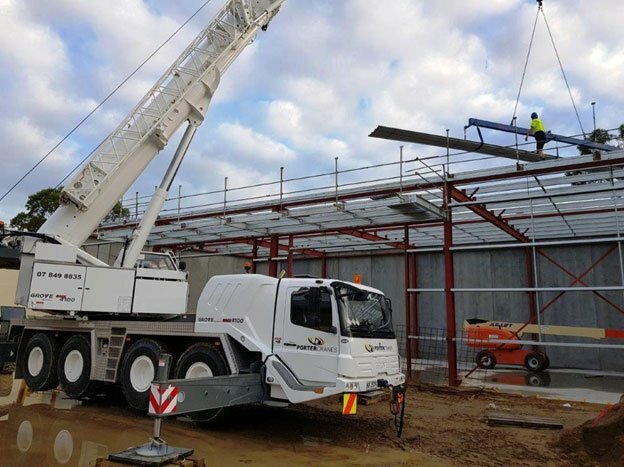 If you have a building project that needs immediate attention and resolution contact your local Specialised Structures branch today or request an estimate. We can provide our expertise to make sure your project meets your budget and vision. 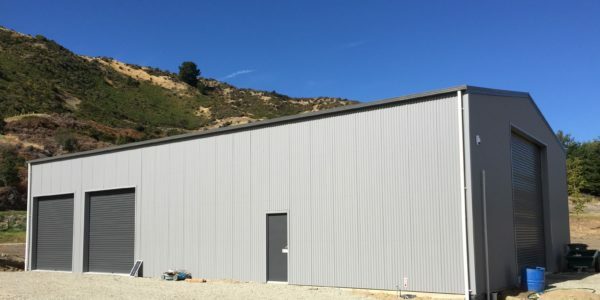 We have a proven record of successful construction of commercial and industrial buildings throughout New Zealand including a diverse range of projects. It could be one of the best investment decisions you will ever make! 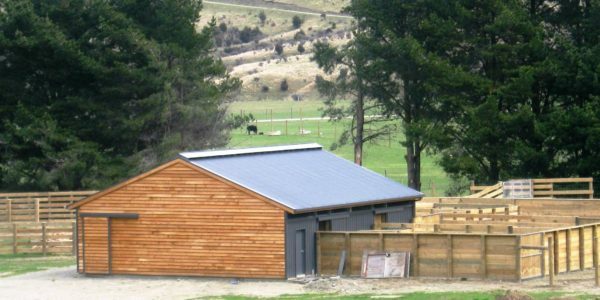 Keen To Build Your Own Shed? Here’s where to start. 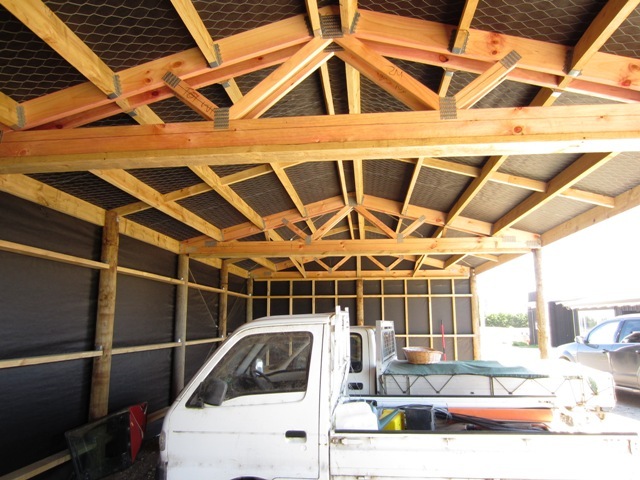 With the holiday season fast approaching you might be keen to build your own shed! 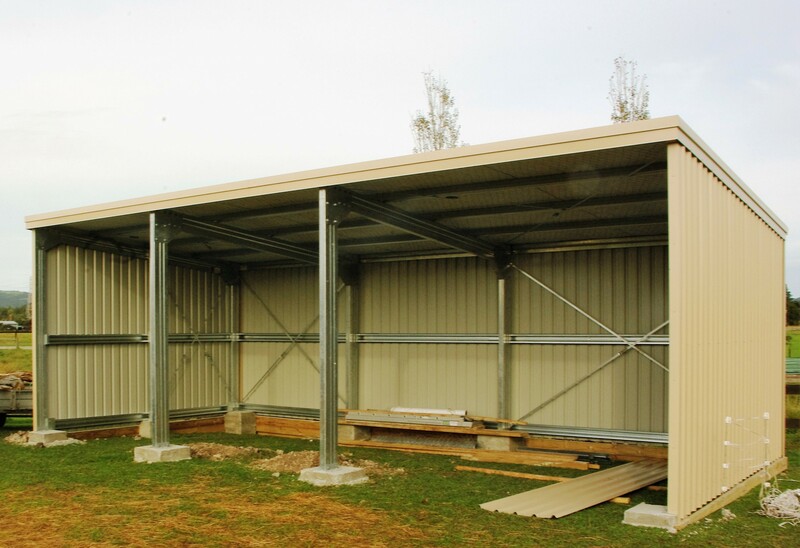 With a Specialised Structure’s construction pack (kitset building) you can build your own shed easily and quickly. 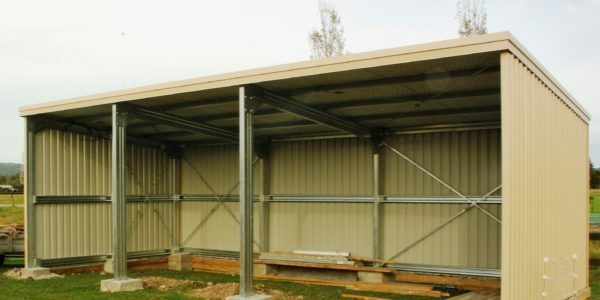 Specialised Structures provide customised construction packs for all types of sheds and buildings and for any purpose! 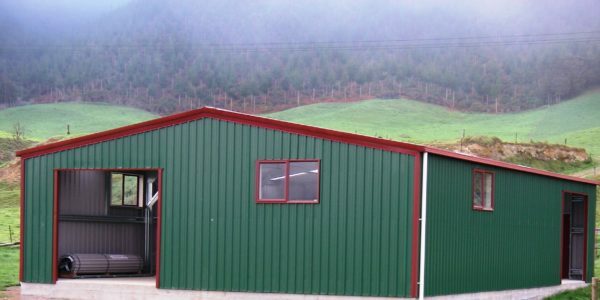 Maybe you fancy building a hobby room, sleep-out or a shed for the farm? Whatever you wish to build our construction packs will make your building project easy and affordable. You can purchase a construction pack/kit for any type and size of portal building. We will work with you to design the building that best meets your needs. Using ‘Plan-It’, our in-house design and engineering programme, we will price the most economical solution that will meet your requirements. 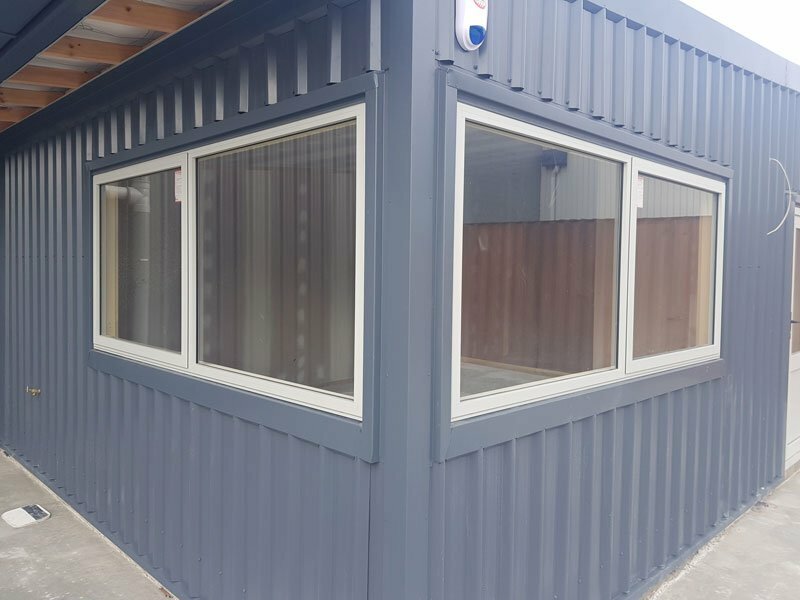 Contruction kit prices from Specialised Structures are affordable, and we can supply you, or your builder, a construction pack with everything you need. You will have full control over your building project! 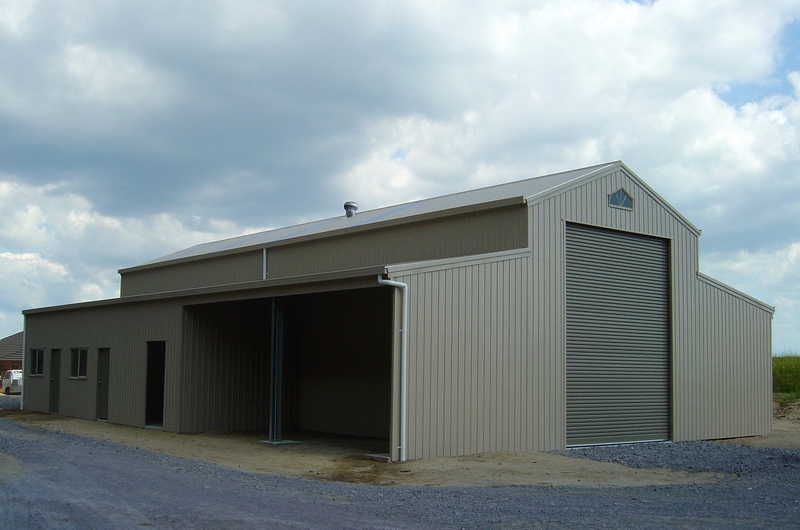 Let us help you design your building to meet your requirements. We will provide relevant PS1 information for your consent process. 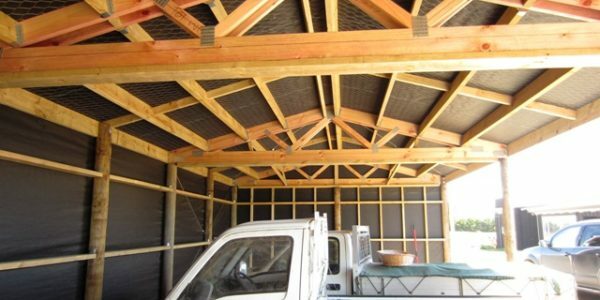 Order a construction pack from Specialised Structures and manage your project yourself. We will deliver the construction pack to your site ready to assemble! Provides the opportunity for you to control the building process. Provides flexibility to utilise your own building resources. You’re in control of your own time-frame expectations. Ability to utilise family or network connections to complete the building. 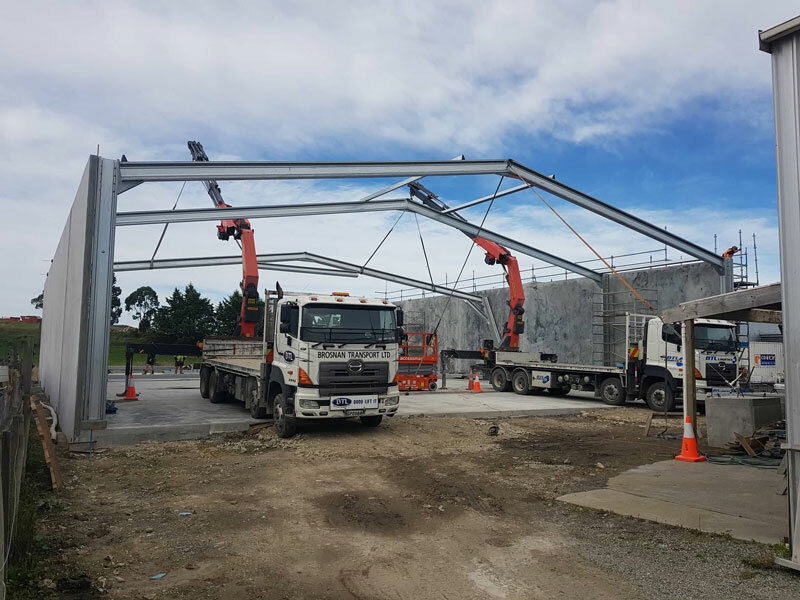 To find out more contact us here today on our freephone 0508 787 828, website: www.specialisedstructures.co.nz. If you wish to request an estimate for a construction kit just fill out our online form here, or contact your local Specialised Structures Merchant.